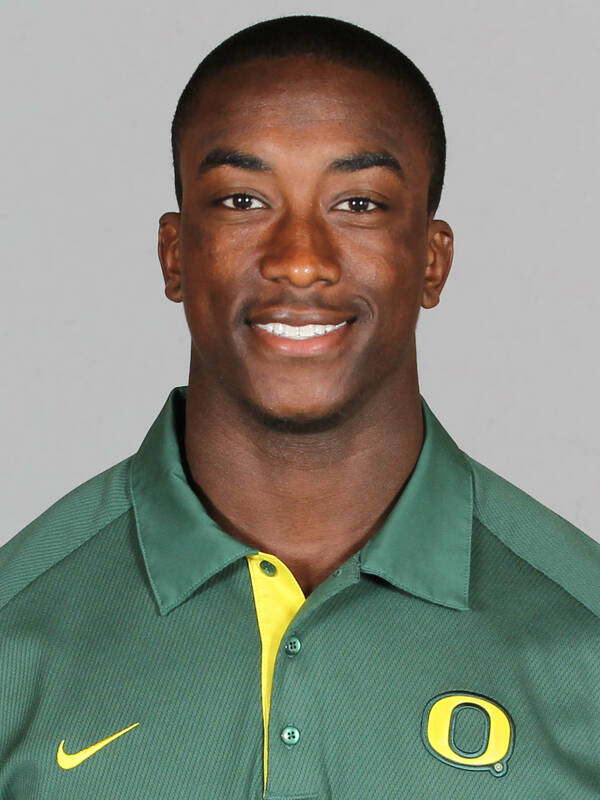 Player information and summary text has been obtained from GoDucks.com the official web site for Oregon Football. Depth positions are taken from the Week 6 Washington Game Notes and other media and internet reports primarily from the blog by Rob Moseley now Editor, GoDucks.com. 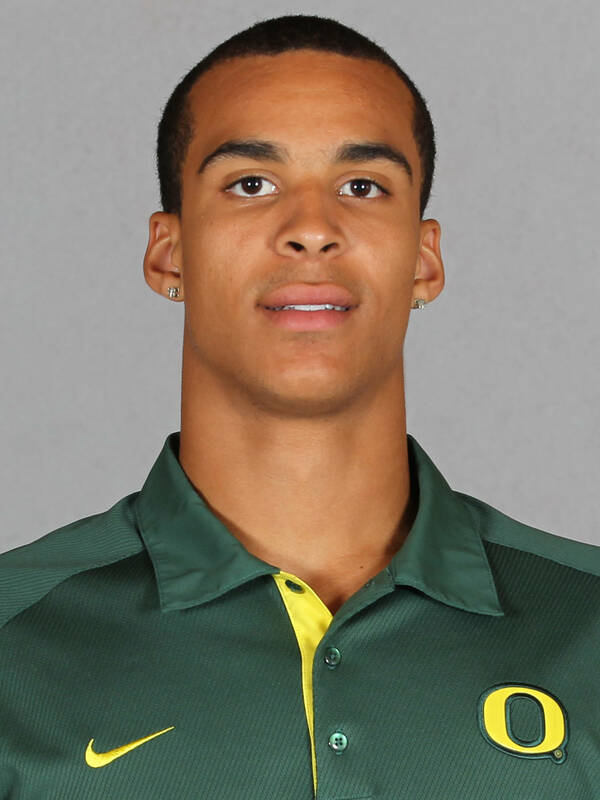 2013 — Oregon’s most experienced receiver leads the team in receptions with 16 attempts for 342 yards . . . Completed two catches to lead the game with 44 reception yards . . . Matched a personal-best of six catches for 125 yards and a touchdown during the home victory vs. Tennessee to record the forth 100-yard effort of his career . . . Caught five passes to gain 118 yards over the season-opener Nicholls. 2013 — The top corner reserve saw action in all four games, with a running total of seven takedowns (three solo) . . . Recorded the longest non-touchdown interception return in school history at 97 yards when the defenseman had the third pick of his career deep in the end zone and ran more than 100 yards before getting stopped three yards from a touchdown, tying Kenny Wheaton (vs. UW in 1994) and Kenny Bryant (at TCU in 1977) for the second-longest overall . . . Also credited with 1.5 tackles-for-loss (five yards) against the Cavaliers. 2013 — Shared the reserve quarterback slot on the depth chart every week of the season, seeing action in all matchups thus far . . . Has seen successful passing in both attempts (2-2), which occured against Nicholls and included a career-first touchdown . . . Also rushed one time to gain 28 yards in the win over the Colonels. 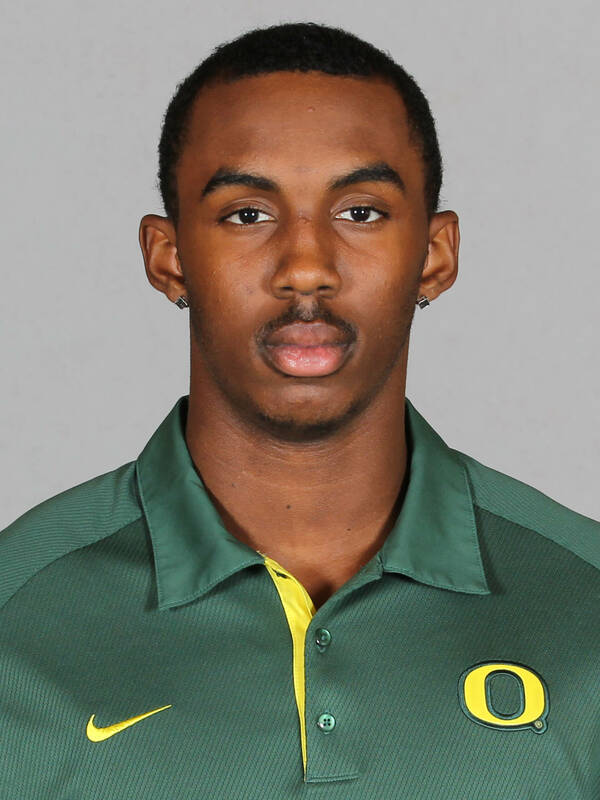 2012 — Graduated from high school early in order to join the Ducks in time for 2012 spring drills . . . Spent the year sharing time running scout team and progressed through 2013 off-season workouts competing for reserve role . . . Completed 13 of 19 passes for 165 yards and two touchdowns in latest Spring Game. 2013 — The primary reserve saw action as a free safety in all four games . . . Had a total of four stops in the win over Cal ... Had a pair of solo stops to contribute to four tackles in the win over Tennessee . . . Caused two pass breakups for a career-best in the victory vs. Virginia, and recorded four tackles, including one solo takedown . . . Made two solo stops during the win against season opener Nicholls, as well as credited with a pass breakup. 2013 — Contributed three total stops in the win over Cal, two solo and one assisted ... Finally came off the bench during the victory over Tennesse to lead the team in solo tackles (four) and tie for second in the game with five takedowns overall. 2012 — Made appearances in seven straight games after missing season opener, recording tackles in six of them … Finished year with 14 tackles (7 solo), including single-game best five stops vs. Colorado . . . Also added four stops against Tennessee Tech . . . Contributed a pair of tackles vs. Washington and at Arizona State (2 solo) while returning an interception 4 yards against the Huskies. 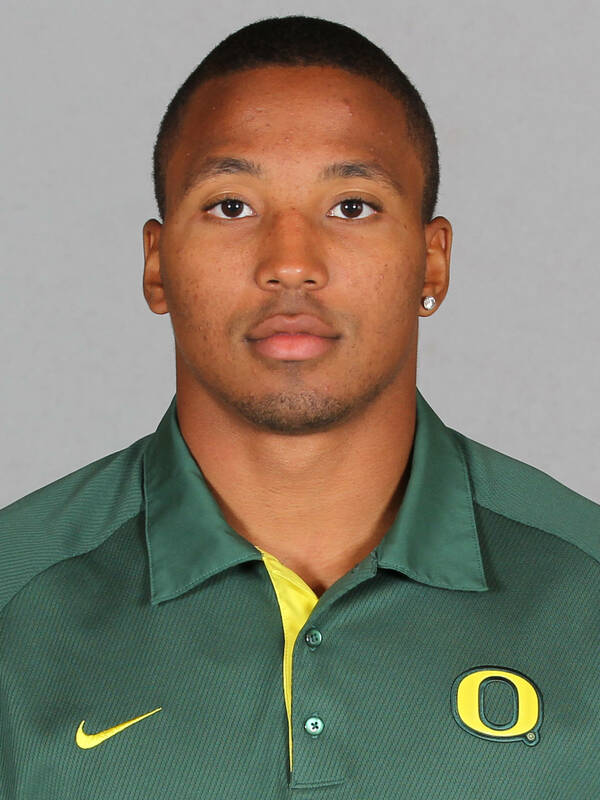 2011 — Worked on the scout team during redshirt season … Took part in spring practice. 2013 — After proving to be a multipurpose offensive threat during his first two seasons, the standout settled into the role of the team's starting running back this year, pacing the team in carries in three of four matchups and posting 42 carries overall . . . With a team high of six touchdowns through the first three games, the impact player leads the team in points scored (36) as well as in all-purpose yardage (485) . . . Made a brief appearance against Cal to return the opening kickoff for 27 yards . . . Had game-highs of 83 rushing yards and 172 all-purpose yards against Tennessee . . . Tied a career-best with three touchdowns (all rushing), eclipsing 100 yards on the ground (11-124) for the fifth time in his career after making the same feat the week before vs. Nicholls (8-124) . . . The standout also shares the kickoff returner spot light on special teams, posting 89 yards on four returns, and is the backup punt returner. 2013 — Started all three games as a primary on the receiver rotation . . . Had a 40 yard reception in the victory over Tennessee after gaining 26 yards over 3 passes and a touchdown at Virginia . . . Also shared the duty of kickoff returner on the depth chart, returning once for 25 yards in the victory over Virginia and two times for 60 yards in the win against Nicholls. 2013 — Saw action in both home games as a reserve defensive back . . . Caused a pass breakup during his appearance in the win over Tennessee . . . Credited with a solo tackle in the season-opening victory against Nicholls. 2012 — Worked with the scout team during redshirt campaign. BEFORE OREGON — The three-year letterman tallied 90 total tackles, averaging 6.4 tackles per game, and recorded five interceptions, three QB sacks, six pass breakups and two fumble recoveries his senior year . . . 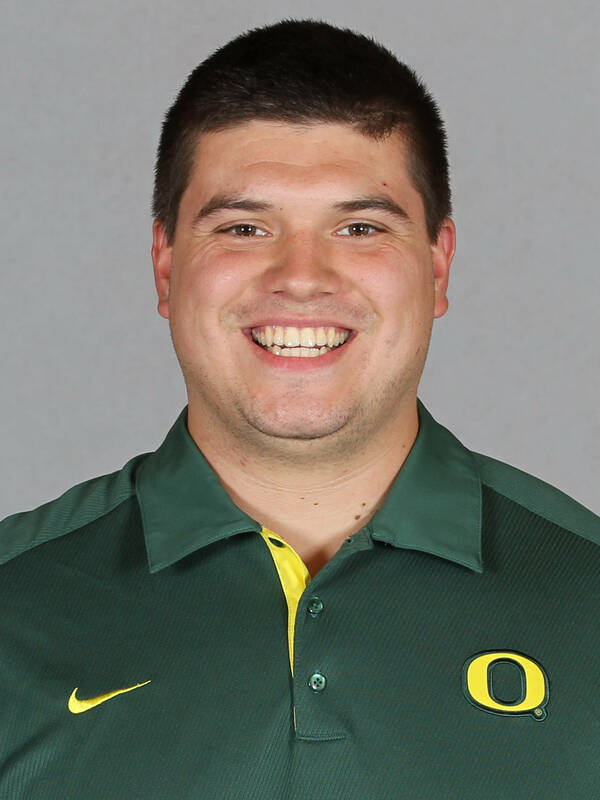 Helped lead Huskies to a 13-1 record in 2011 as well as two Division I state titles in three seasons . . . Selected to Arizona Football Coaches Association Top 25 Team at defensive back and chosen to the Division I all-state first team on defense his final prep campaign . . . Recorded 46 tackles, two sacks, three interceptions and four pass breakups as a junior, earning all-region plaudits. 2013 — The starting defensive tackle recorded atleast one stop in the first three matchups of the season . . . Had three tackles, including one solo takedown vs. Virginia . . . Made a career-first solo sack for a four-yard loss in the season-opening win against Nicholls. 2013 — The top reserve running back has stepped up this season to start four of the five games and now leads the team in rushing attempts and yards, accummulating 448 yards on 71 attempts . . . Recorded his third 100-yard rushing game of the season (fourth career) with 122 yards on a game-high 23 carries against Colorado after reaching a career-high 130 yards rushing for two scores against California . . . Has seen a reception in every appearance for a total gain of 56 yards, and recorded a touchdown on a season-longest 49-yard run vs. the Colonels. 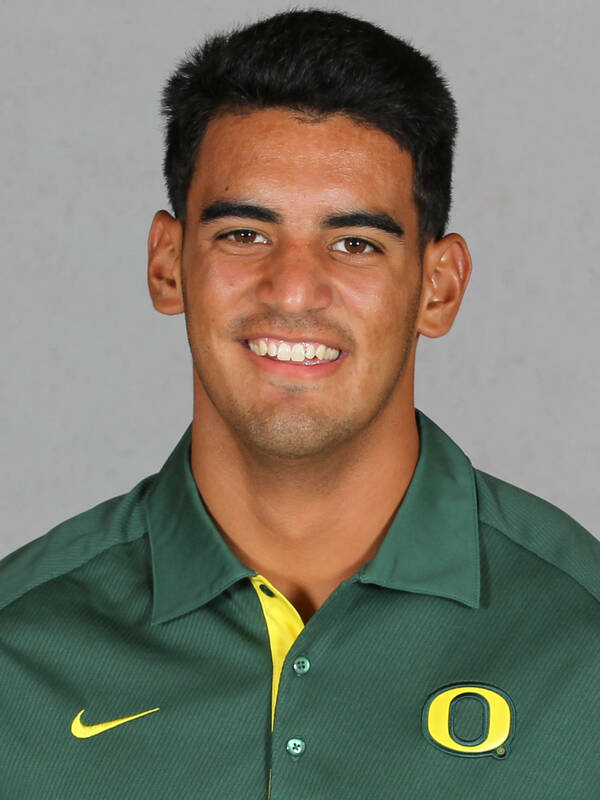 BEFORE OREGON — Afforded three-star acclaim by ESPN.com and Rivals.com while earning first-team all-district quarterback honors . . . Threw for 2,769 yards and 29 touchdowns his senior year, in addition to rushing for 808 yards and 12 scores, to help lead the Longhorns to the Texas Class 5A Division 2 state championship game . . . Displayed his competitive moxie by throwing for 200 yards and two touchdowns in addition to rushing for another 83 yards and a third score to come close to pulling the upset over seven-time state champion Katy for the Class 5A Division II state title . . . Played a big part in the school accumulating an 11-5 record as well as a No. 7 state ranking in 2012 under head coach Joey McGuire after posting an 8-4 mark in 2011 . . . Completed 71 of 105 passes (67.6%) for 997 yards and eight touchdowns as a junior, in addition to running for 875 yards (7.9 avg.) and 11 TDs. 2013 — Key component of the receiving rotation and special teams, the primary for three of four games this season ranks second on the team in receptions (14) for two scores and leads in punt returns with six (219 yards gained) . 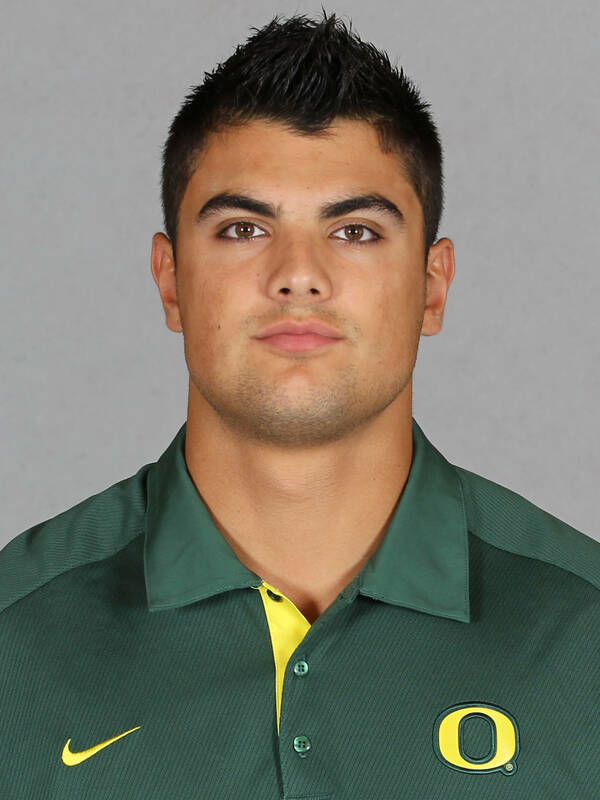 . . Tied a school-record and set the UO conference when he returned two punts for touchdowns (142 yards gained), including a career-longest return of 75 yards, during the matchup aginst Cal . . . Made a career-high six catches for 78 yards against the Vols . . . Caught three passes over 54 yards, including a 30-yard scoring catch in the win over Virginia . . . Recorded a touchdown on a 27-yard pass in the winning season-opener vs. the Colonels. 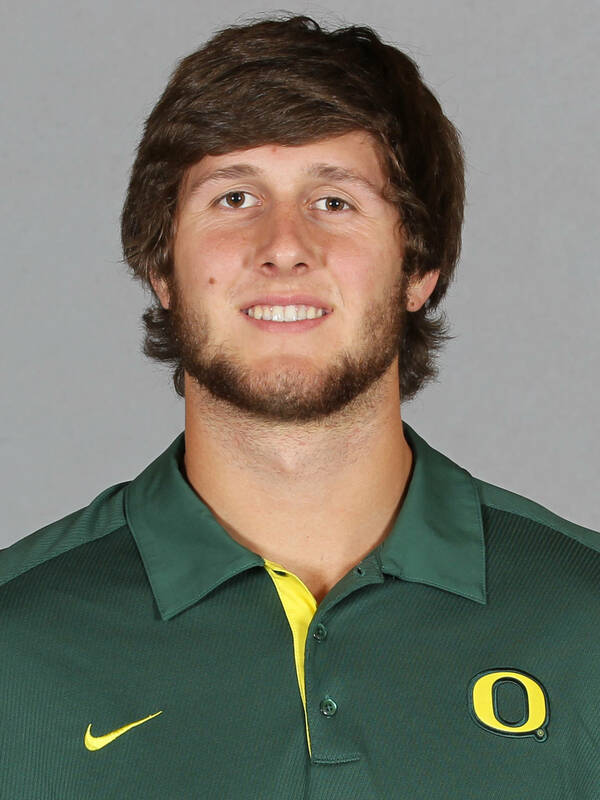 BEFORE OREGON — Made the 6A all-state first team as a Quarterback in 2012 . . . Led the Irish to the 2012 state championship for a 13-6 win against Lake Oswego, where Alie was named game MVP . . . Named player of the week by MaxPreps and the Oregon Athletic Coaches Association (OACA) after he helped lead Sheldon to a 62-27 victory over Southridge in the quarterfinals, throwing for five touchdowns on 24 completions in 30 attempts for 345 yards and rushing for 108 yards on 13 carries for one score . . . Completed 247 of 360 passes over 3183 total passing yards his senior year, leading the team to finish with a perfect 14-0 season . . . The three-year letterman accumulated 138 carries over 563 yards for 10 touchdowns overall . . . Also a pitcher in baseball, the three-year letterman saw another state championship win of 6-5 in 2013 against Clakamas . . . Also a two-year letterman in basketball, playing the position of point guard. Jamias Jones, who set a school record last week with a 96-yard touchdown run, one of four he scored. - See more at: http://latimesblogs.latimes.com/varsitytimesinsider/2009/09/football-who-do-you-invite-for-homecoming. 2013 — The strong safety opened all four contests of the season . . . A key contributer, the defensman led the team in tackles (six) during the Tennessee victory, recording three solo takedowns . . . Opened the season with two solo stops (three total) vs. Nicholls. 2013 — A key contributer to the defense's stats, the main second-line corner saw action in all three games, recording three solo stops in all appearances . . . Ranking fourth on the team with four tackles, the defenseman returned a kickoff to gain 17 yards and had one pass breakup during the home victory over Tennessee . . . Credited with five takedowns, including a tackle-for-loss, and a pass breakup against Virginia, and racked up four stops against season-opener Nicholls. 2013 — Was the primary cornerback for all four games . . . Intercepted his first pass of the season and fifth of his career in addition to recording eight stops, including four solo takedowns vs. Cal . . . Had three solo and two assisted stops against Virginia . . . Ranked third in tackles (six), including two solo takedowns, during the season-opening win against Nicholls. 2013 — Appeared in all three victories as the primary special team's holder . . . Had a successful rush attempt for a two-point conversion against Virginia. 2012 — Team’s reserve quarterback stepped onto the field against Tennessee Tech and Colorado, but contributions extend beyond what is visible on Saturdays . . . 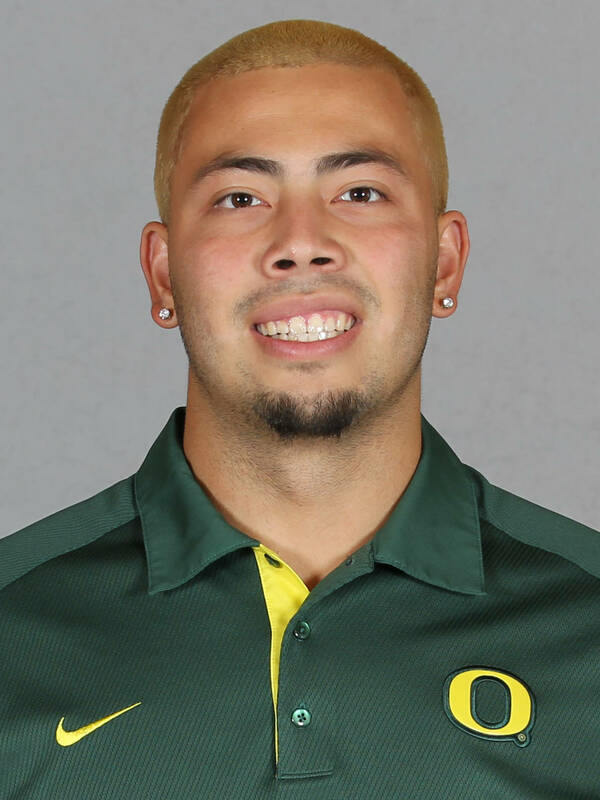 Carried football twice vs. Colorado for 6 yards while taking part in 13 snaps . 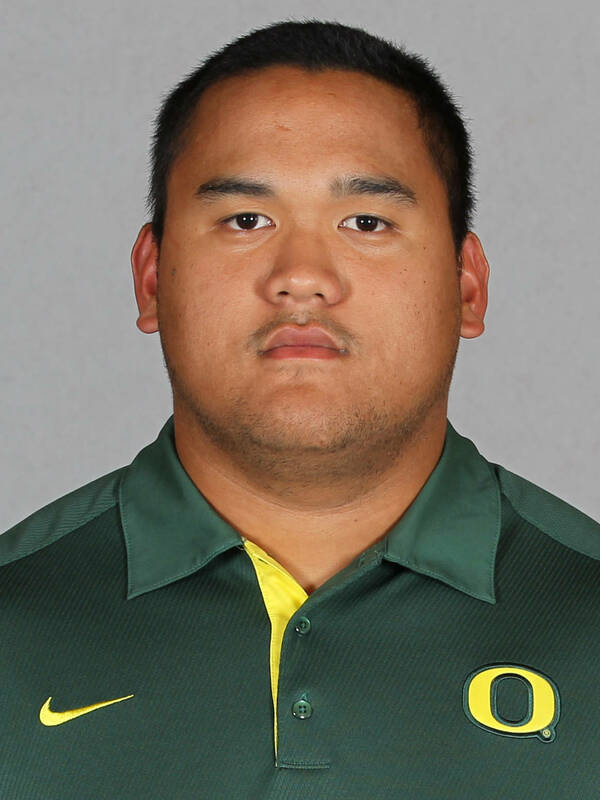 . . One of team’s strongest quarterbacks lifted 308 lbs. in clean and benched 305 lbs. following off-season workouts . . . Former walk-on was awarded a scholarship for his final season prior to conclusion of spring drills. 2011 — Appeared in three games and attempted one pass … Rushed for 7 yards on two attempts in win at Colorado … Offensive scout team player of the year. 2013 — The team's third-leading receiver of the season (eight, 117 yards), shared the starting wide receiver position on the depth chart in the first four contests of the season, but played as the top reserve in all matchups thus far . . . Credited with 61 yards on three catches, including a 45-yard touchdown reception in the victory against Tennessee . . . Added a pair of catches in both the win at Virginia and the season-opening triumph against Nicholls. 2012 — Made appearances in all four games as a secondary quarterback, completing five for seven passing attempts to gain 34 yards overall . . . Recorded a career-first touchdown on an eight-yard pass during the victory over Tennesse. 2012 — Traveled with team as a reserve quarterback during his redshirt season while gaining experience on the scout team . . . 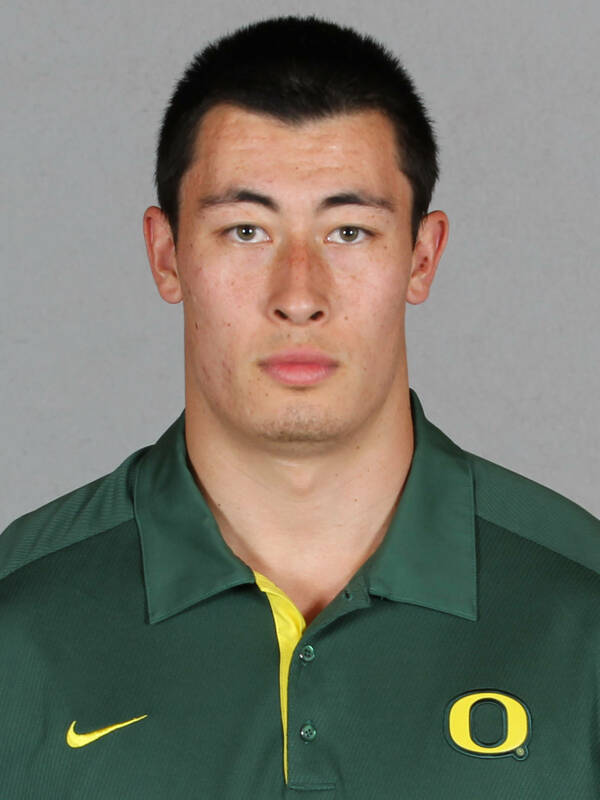 Completed 22 of 28 passes for 217 yards and two touchdowns in 2013 Spring Game. BEFORE OREGON — A two-year starter at quarterback, won the East Bay Athletic League (EBAL) MVP in 2011 . . . Completed 234 passes, piling up 3,278 passing yards with 31 passing touchdowns while rushing for 136 yards and seven additional scores as a senior . . . Best individual game came against Heritage High School when he completed 20 passes for 355 yards and five touchdowns . . . As a junior, threw for 2,449 passing yards and 26 touchdowns while adding 205 yards on the ground. 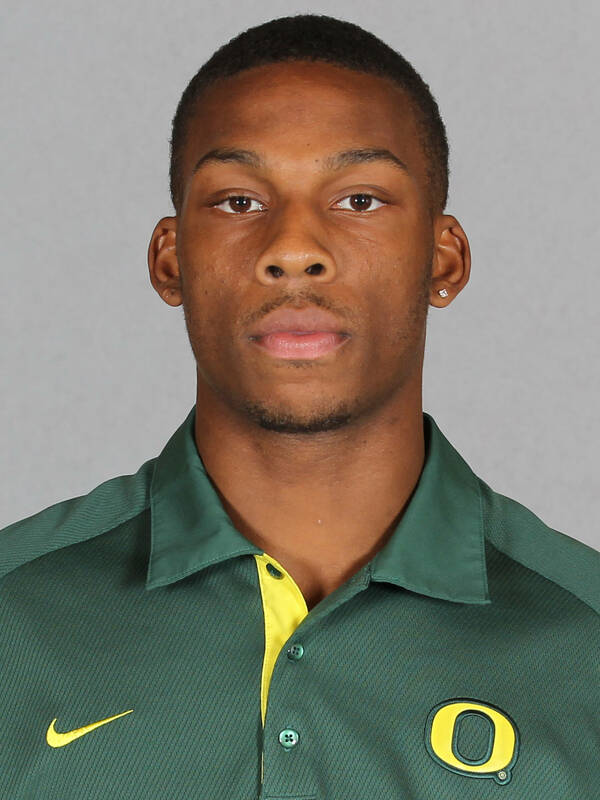 2012 — Appearing in all 13 games, caught passes in each of first four outings… Completed first year with 11 catches for 106 yards in addition to picking up 8 yards on the ground at Arizona State … Hauled in team-high five catches for 41 yards in win vs. Arizona … Also grabbed pair of receptions vs. Arkansas State, Fresno State and Tennessee Tech . . . Opened his collegiate career with a pair of catches in each of his first three games, topped by 25 yards in receptions vs. Tennessee Tech … Second among receivers with 35-inch vertical leap. 2012 — Appeared in 11 games, including starting assignments against Tennessee Tech and Arizona … Stepped onto the field for 20 snaps or more in seven of the first eight contests ... Grabbed receptions in each of his first four games, including two catches (11 yards) against Arizona ... Also snagged a 15-yard grab in the opener vs. Arkansas State ... 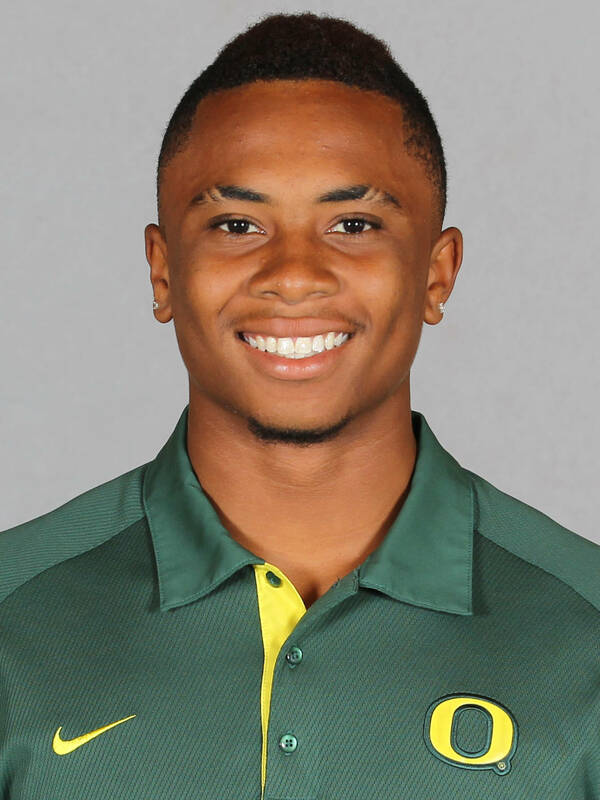 Contributed on special teams as well, recording tackles against Fresno State, Tennesse Tech, Washington State and Colorado ... Earned Pac-12 academic all-conference honorable mention acclaim ... 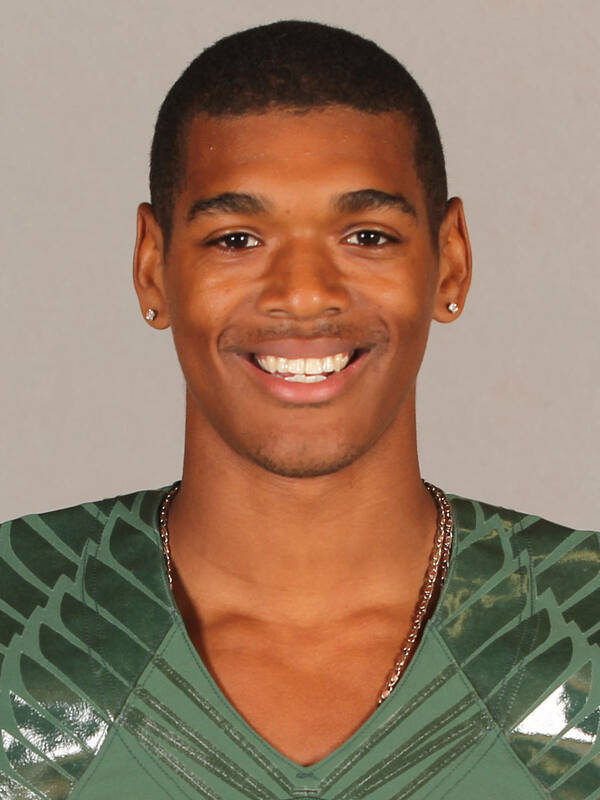 Led all receivers with nine catches (56 yards) in 2013 Spring Game. 22-yard catch in win vs. Missouri State … Caught first career reception for 12 yards in victory vs. Nevada. 2013 — Saw action as a receiving reserve in all three games . . . Gained 11 yards on one reception during an appearance vs. Tennessee . . . Made two catches for 30 yards, including a score on a career-best 23-yard pass in the season-opening victory against Nicholls. 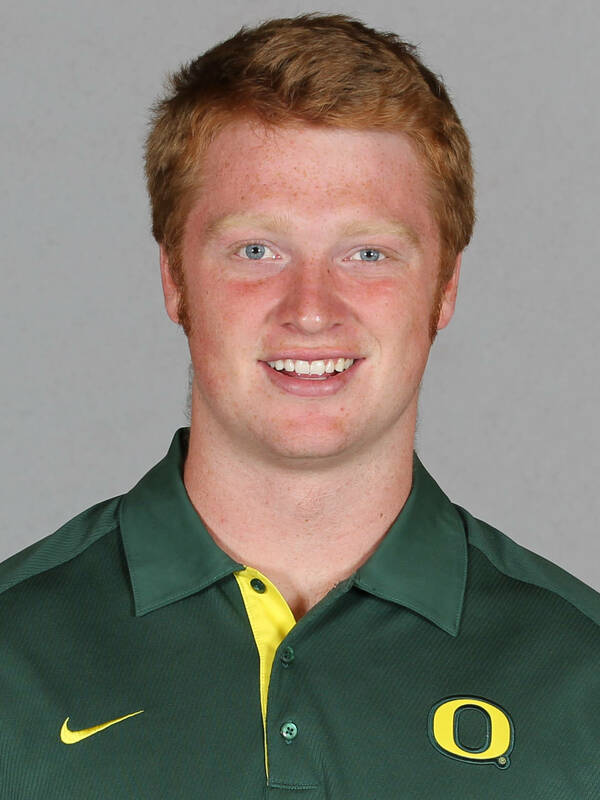 2012 — Member of the scout team during his redshirt campaign . . . Caught one pass for 20 yards in Spring Game. BEFORE OREGON — A three-year letterwinner at Fort Bend Elkins under head coach Dennis Brantley ... 5A Texas Region III all-district selection ... Finished his prep career with 126 receptions for 1,920 yards and 22 touchdowns ... Led the Knights with 52 receptions for 892 yards and 10 touchdowns as a senior ... Caught 51 balls for 678 yards and eight TDs as a junior after posting totals of 23 catches, 350 yards and four scores as a sophomore ... Also a starting guard on the Knights’ basketball team, ranking second on the squad in scoring as both a junior and a senior. 2013 — The primary free safety has been a leader for the defense throughout the first four games of the season . . . Had four total stops in the win against Cal, two solo and two assisted ... Posted two solo takedowns against Virginia (five total), including a tackle-for-loss of one yard. 2013 — The starting linebacker leads the defense, accummulating 35 tackles, including 15 solo takedowns, over all four games . . . Recorded an assisted tackle-for-loss (one yard) during the victory at Virginia, and had a career and game-high 11 tackles in the season-opening contest against Nicholls. 2012 — Started one of 12 appearances during a season when he ranked eighth on team in tackles and third among linebackers (41) … Logged 45 snaps or more in seven of first eight games, recording a personal-best nine tackles in win over Colorado in addition to returning an interception 14 yards . . . Also credited with six tackles in each of previous two weeks against Washington and Arizona State (combining for seven unassisted) . . . Recorded a quintet of stops in opener vs. Arkansas State … Made three stops in wins vs. Tennessee Tech and California . . . Awarded Pac-12 Academic All-Conference honorable mention acclaim for second year in a row. 2012 — Caught a two yard pass for a touchdown in win at Oregon State … Recorded one solo tackle and had one grab for an 18-yard touchdown in victory at California … Caught one pass for 32 yards in win vs. Colorado … Recovered a fumble against Washington … Recorded one catch for 12 yards in win over Tennessee Tech … Made one tackle in victory vs. Fresno State … Had two receptions for 39 yards, including a 22-yard long reception in collegiate debut in win over Arkansas State … Also had two key solo stops on special teams against the Red Wolves. 2011 — Offensive scout team player of the week leading up to victory over Missouri State. 2013 — One of six true freshman to come off the bench this season, the team's fourth leading rusher (174 yards on 25 attempts) saw action in three of four games this season as running back . . . Ran 13 times for a career-best 94 yards to score for a third straight week against Cal . . . Scored a 3-yard touchdown and a had a second score on a 31-yard run on his first play as a collegian, finishing his debut with four carries for 51 yards vs. the Cavaliers. 2013 — The team's primary strong linebacker has completed 19 stops (nine solo) over all four games . . . Had one forced fumble and nine total stops in the win over Cal ... Made seven stops, including three solo takedowns, at Virginia . . . Recorded a tackle-for-loss of two yards to contribute to three stops and caused a pass breakup in the season-opening win against Nicholls. 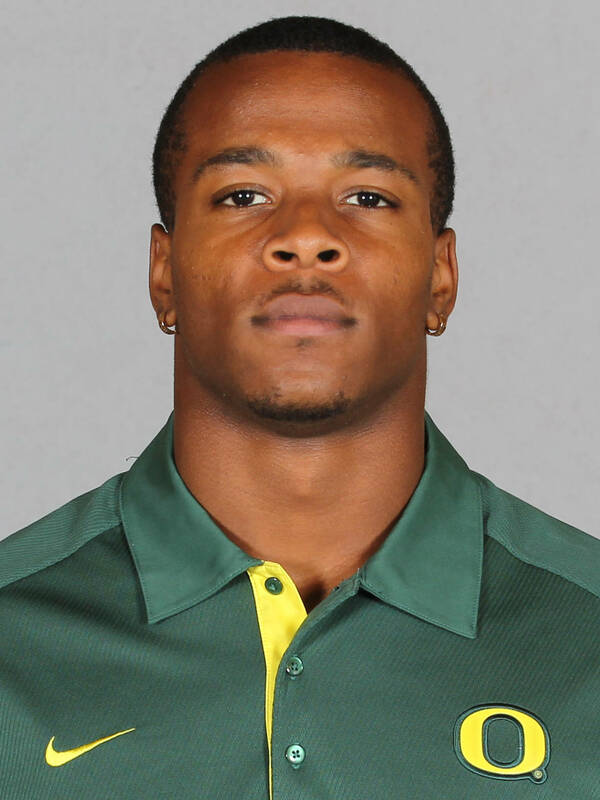 2013 — Made appearances at both home games as a defensive back . . .Had two tackles (one solo) during the win over Tennessee . . . Credited with three assisted takedowns in the season-opening victory against Nicholls. 2012 — Converted from wide receiver to defensive back in third week of the season … Tied a personal-best with three tackles vs. Colorado while making appearances in all 13 games . . . Also contributed a pair of stops against Tennessee Tech and USC . . . Recovered a fumble in win at California . 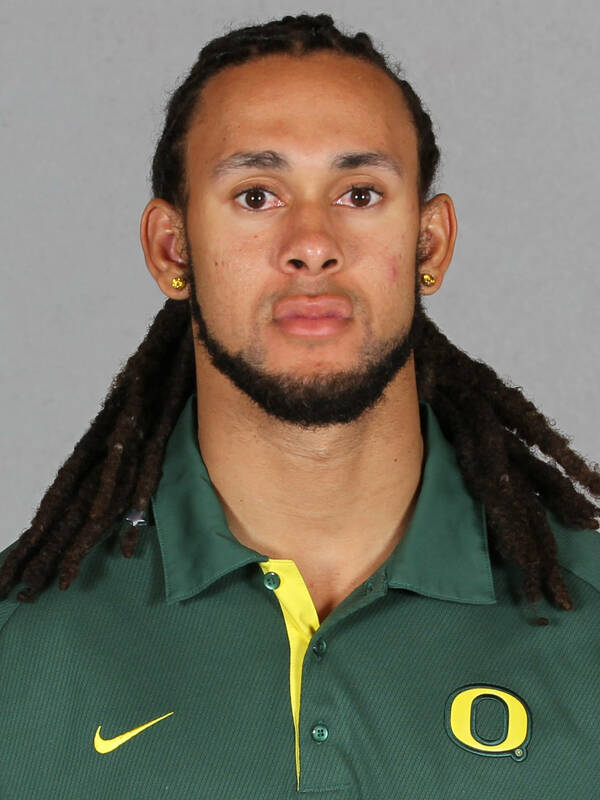 . . Made a key play on special teams, forcing a fumble and making a solo tackle in win against Washington State … Made first collegiate reception for 11 yards in win vs. Arkansas State prior to switching to other side of the ball . . . Added four tackles in Spring Game . . . Clocked as one of secondary’s swiftest players in shuttle run (3.96) and bench pressed 305 lbs. 2013 — The team's starting corner has been a key component on the defensive line, posting 16 tackles through the first four games . . . Had three solo and three assisted stops in the win over Cal ... Made three unassisted and one shared stops against Tennessee . . . Returned an interception during the Virginia matchup for a gain of 16 yards, in addtion to recording a pair of solo takedowns (four total). 2013 — Broke up a pass in his first career appearance in the season-opening win against Nicholls. 2012 — Participated with the scout team during redshirt season. 2013 — Made a career appearance in the season-opening win against Nicholls. 2012 — Redshirt campaign, worked on the scout team . . . 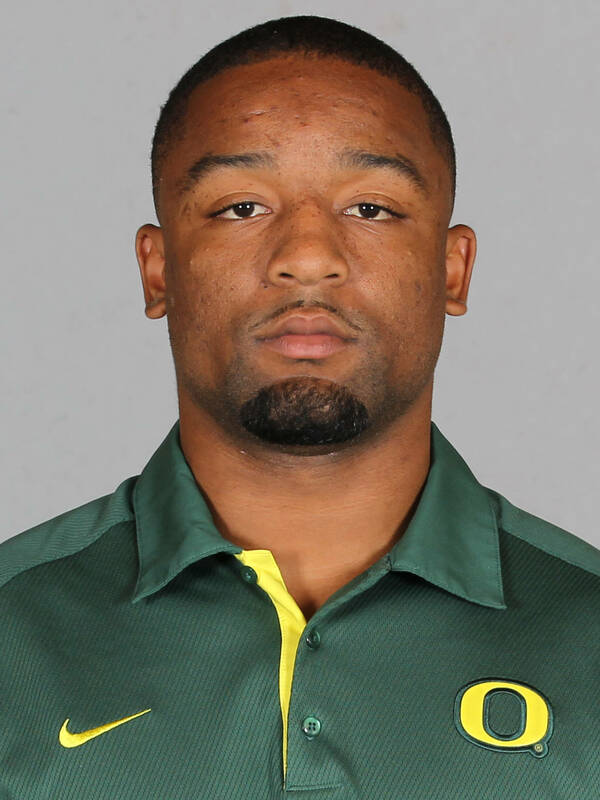 Credited with five tackles (four solo) in Spring Game. 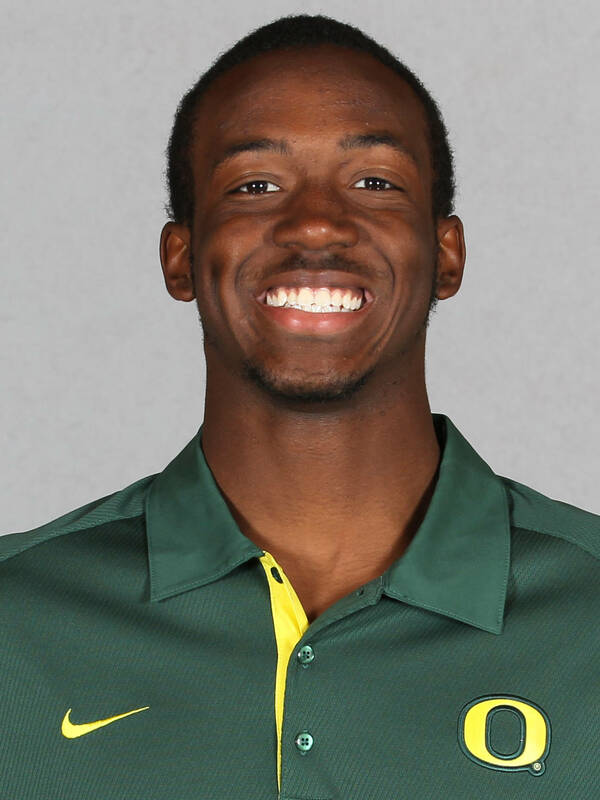 BEFORE OREGON — Earned second-team all-University Interscholastic League . . . Named a Gatorade National Performer . . . He totaled 20 tackles, five pass deflections and three interceptions during his senior season . 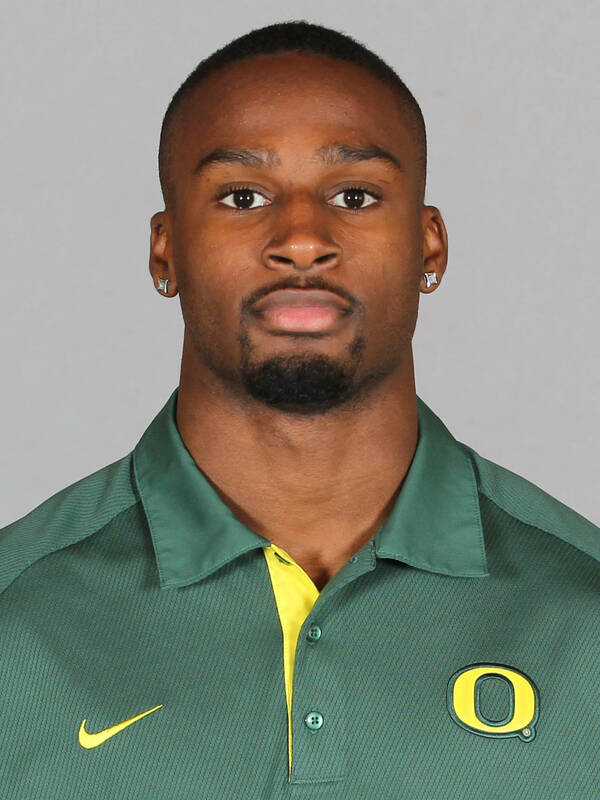 . . As a senior, played the defensive back position opposite of his brother Eric. 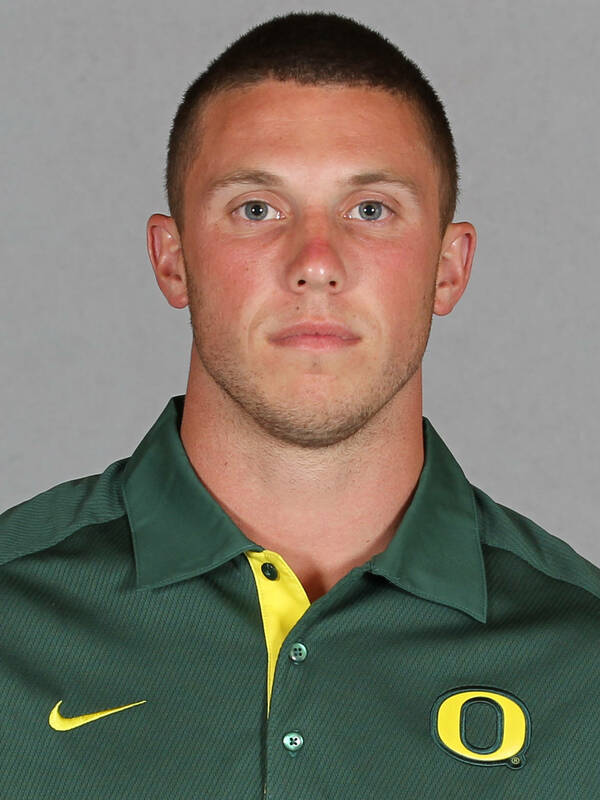 BEFORE OREGON — Spent two years at College of the Sequoias, playing for head coach Robert Dougherty ... Punted 67 times over 10 games in 2011 ... Had six punts of 50-plus yards and dropped eight inside the 20-yard line against only one touchback ... Student of the Chris Sailer Kicking school ... Top punter at the Nike Summer Camp in Los Angeles in 2011 ... Punted and played wide receiver at El Diamante High School for head coach Mark Rogers ... Helped the Miners to a 9-2 overall mark and unblemished 6-0 conference record as a senior, and an 11-2 (6-0) mark as a junior. 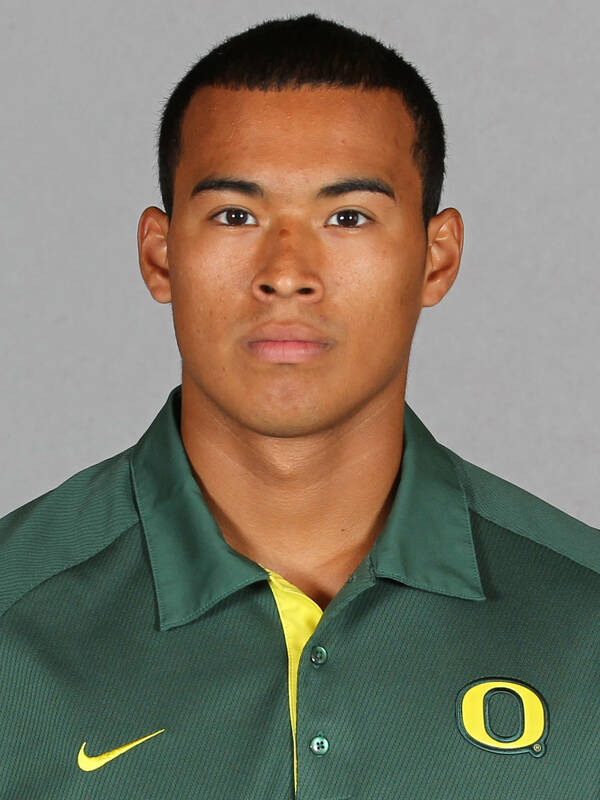 2013 — Contributed to offense and special teams in all five games . . . Ran for a personal-best 88 yeards on 10 attempts, which included a longest run in his career (40 yards) in the win at Colorado . . . Ran six times to gain 22 yards and recorded three tackles (two solo) against Virginia . . . During the win over season-opener Nicholls, the former walk-on accumulated 53 yards on three carries and made one solo and one assisted takedown. 2012 — The running back saw action in the victory over Cal and the season-opening win against Nicholls, rushing for a single-game high 18 yards on four attempts. 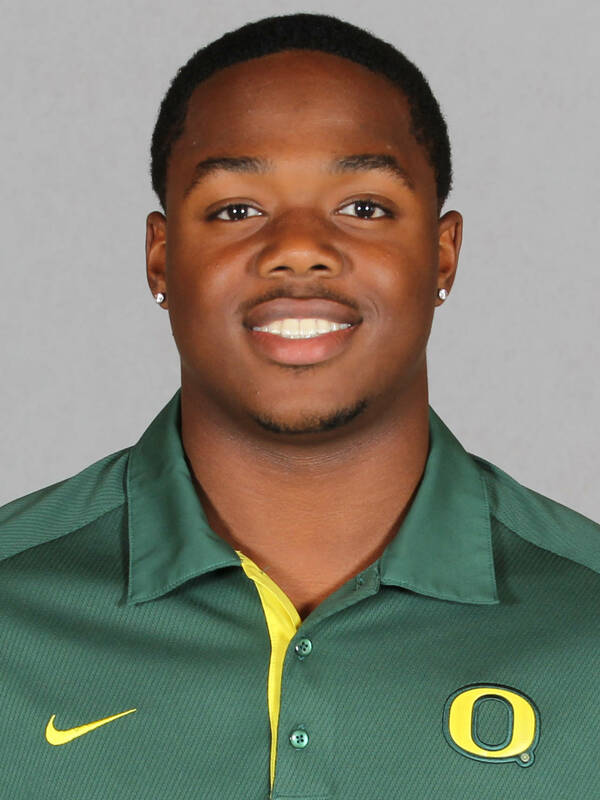 2012 — Team’s eighth-leading rusher made appearances in seven games … Ran with football 16 times for 40 yards, including long gain of 7 yards vs. Washington State . . . Carried the ball five times for 13 yards in win vs. Colorado … Rushed for 16 yards on three attempts in victory vs. Washington State … Had one carry for 1 yard in collegiate debut in victory over Arkansas State . . . Was recipient of academic 2nd-team all-conference honors . . . Led all running backs with 320-lb. bench press while setting the pace with 3.88-second shuttle run. 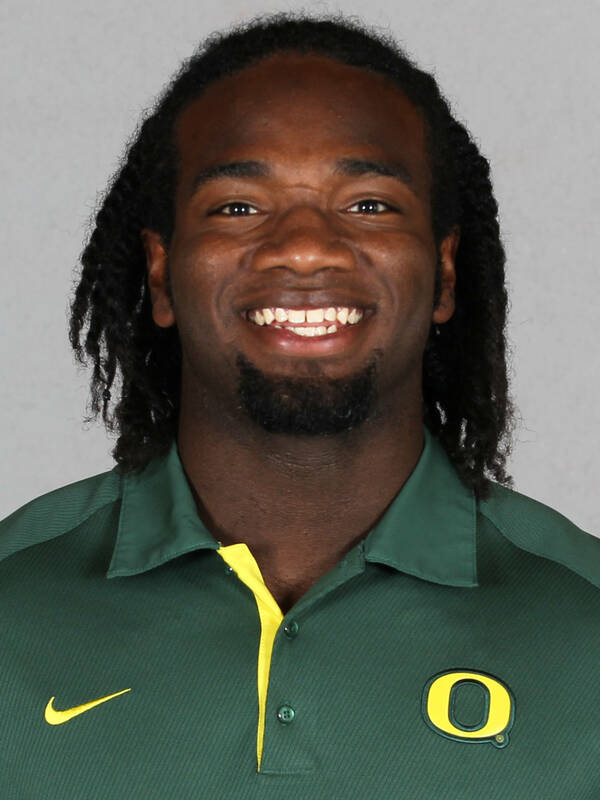 2011 — Benched 295 pounds during winter conditioning, tied for the best among running backs. 2013 — Saw action as a tight end during the wins over Tennessee and Virginia. 2012 — Worked out with the scout team during his redshirt season . . . Enrolled early and participated in 2012 spring practice . . . Caught one pass for 9 yards in 2013 Spring Game. all-Colorado first team (defense) and named to the 2011 5A all-state first team at linebacker … Hauled in 33 passes for 456 yards and six touchdowns, averaging 13.8 yards per catch as a junior … Named to the 2010 Colorado all-league 5A Creek first team on offense as an H-Back and was honorable mention all-state. 2013 — The secondary linebacker has made at least one tackle each of the four games . . . Had three total stops in the win over Cal, one solo and two assisted ... Recorded three takedowns, including two solo stops in the season-opening win against Nicholls. 2013 —Saw action in all of the first four games as the top reserve middle linebacker . . . Had three stops in the win over Cal, one solo and two assisted ... Had three takedowns, including two solo tackles in the victory against Tennessee . . . Made two assisted tackles in the win vs. Virginia . . . Picked up a career-first fumble recovery for a six-yard gain and recorded a solo stop during an appearance in the season-opening win over Nicholls. 2013 — The reserve quarterback saw action in the matchups vs. Cal, Tennessee and Nicholls . . . Rushed the ball three times for 16 yards against the Vols and twice to gain 11 yards over the Colonels.
. . . Ran for 31 yards and one touchdown (8 yards) on seven carries in 2013 Spring Game. BEFORE OREGON — The three-year letterman was two-time 3A all-state linebacker, earning first-team honors as a senior … Played linebacker, tight end, wide receiver, running back and fullback for the Honkers … Once made 33 tackles in a single game … Also lettered three times in basketball and twice each in baseball and track and field … Was a regional record-holder in the javelin. 2013 — The reserve linebacker made his debut in the season-opener against Nicholls, and then saw action in the three games following . . . Had a career high nine tackles in the fourth game of the season against Cal (nine solo, three assits). 2012 — Enrolled for classes in January and benefitted from participation in 2013 spring drills . . . 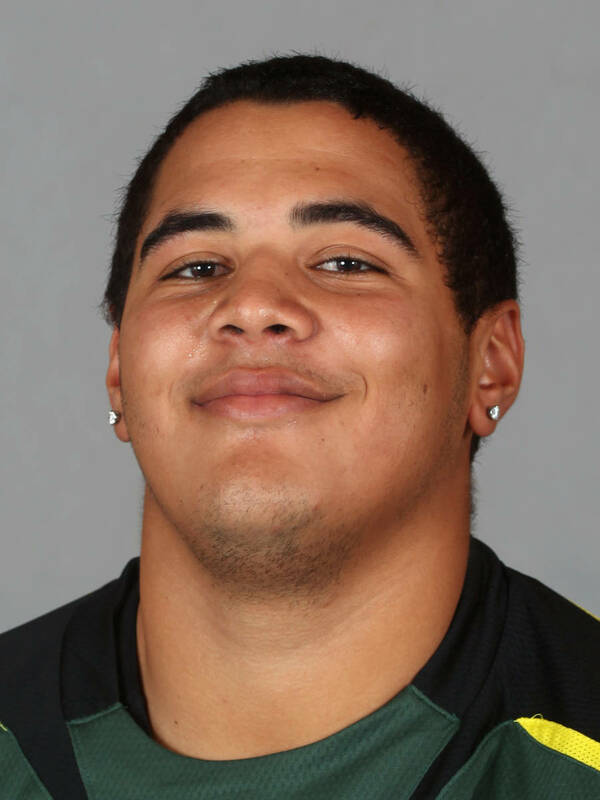 Recorded five tackles in 2013 Spring Game, including an assisted tackle-for-loss of 1 yard . 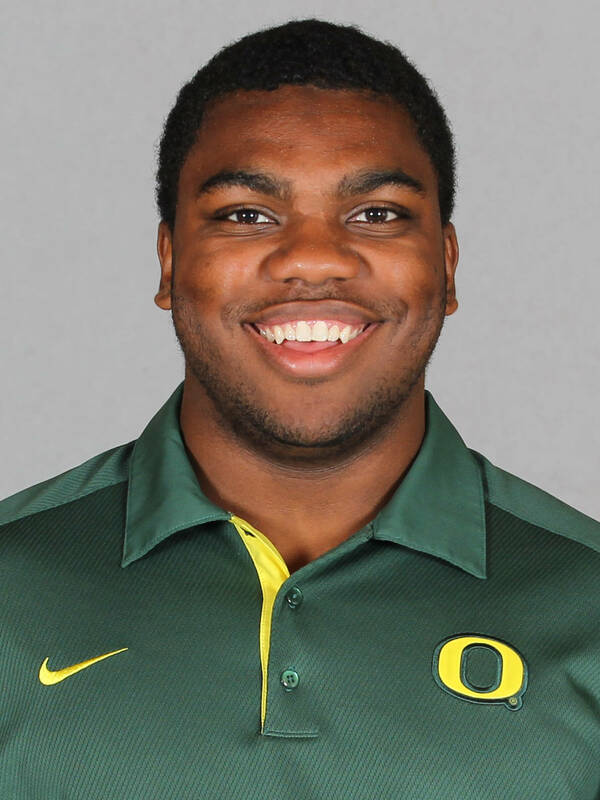 . . One of team’s strongest linebackers cleared 330-lb. clean lift and 325-lb. bench press, as well as timed in 4.89 electronic 40. 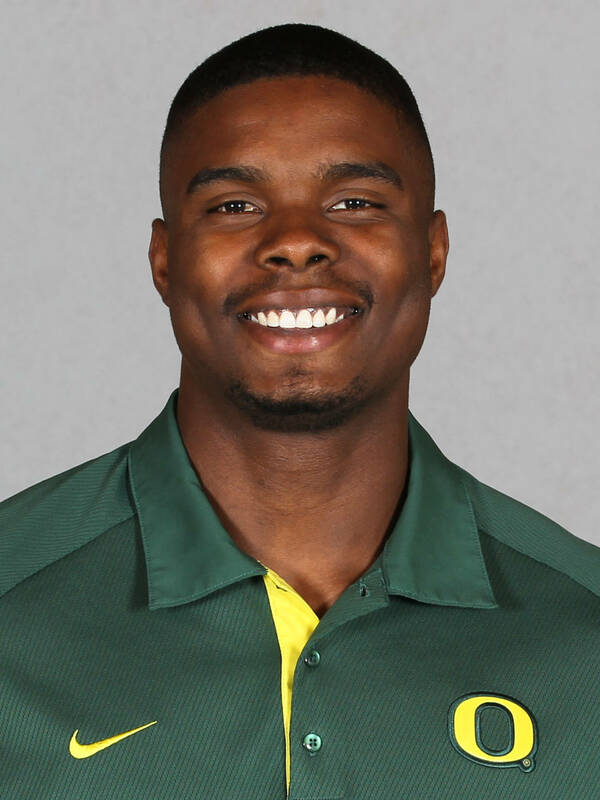 BEFORE OREGON — The versatile three-year letterman contributed on both sides of the field as a running back and defensive back, as well as on special teams as a kicker for the Wolverines . . . Overall he accumulated 1253 total rushing yards on 299 carries for 15 touchdowns and racked up 4 scores over 270 yards and 40 receptions . . . Made 11 tackles, 7 of which were unassisted throughout his varsity years. . . His sophomore year he set a school record with a 96-yard touchdown . . . Also sprinted for the Wolverine's track team. 2010 — Tied for third-best squat among running backs with a lift of 375 lbs. during winter testing. 2009 — Worked on the scout team during redshirt season. BEFORE OREGON — Was a two-year varsity running back under head coach Larry Muir ... A first-team All-Foothill League selection, he carried the ball 211 times for 1,672 en route to 26 touchdowns in 2008 ... Also amassed 22 catches for 232 yards and a touchdown ... Voted second-team all-league his junior year while rushing the ball 123 times for 951 yards and 10 touchdowns, and compiled 10 catches for 196 yards and four touchdowns through the air ... Lead the Vikings to a 10-3 season as a senior before losing in the third round of the state playoffs to Moorpark HS. 2013 —Recorded one tackle during an appearance in the victory over Tennessee. 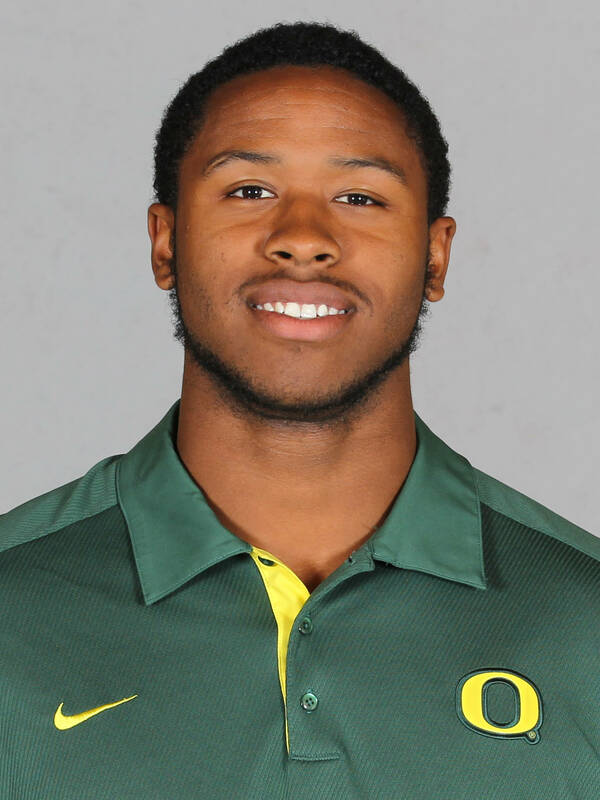 2012 — Appeared in three games … Made one stop in victory at Oregon State … Recorded three tackles in win vs. Colorado. 2011 — Appeared in two games, registering solo stops in consecutive wins vs. Missouri State and Nevada … Benched 335 lbs., fourth among linebackers. 2010 — Participated as a member of the scout team during redshirt season. BEFORE OREGON — Graduated from Archbishop Riordan High School … Earning West Catholic Athletic League first team all-league … Received all-Metro honors from the San Francisco Chronical… Earned Team Academic Award … Attended Cushing Academy for one year after high school … Placed on the All-New England Football Team … Awarded defensive MVP … Named Boston Globe Class-A All Star. 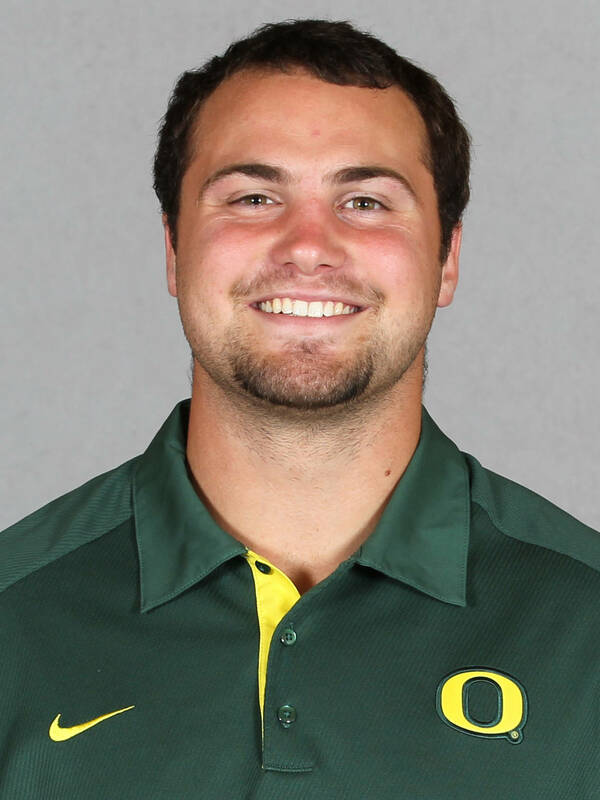 BEFORE OREGON — The four-year letterwinner had a best 60-yard punt for the Radiers . 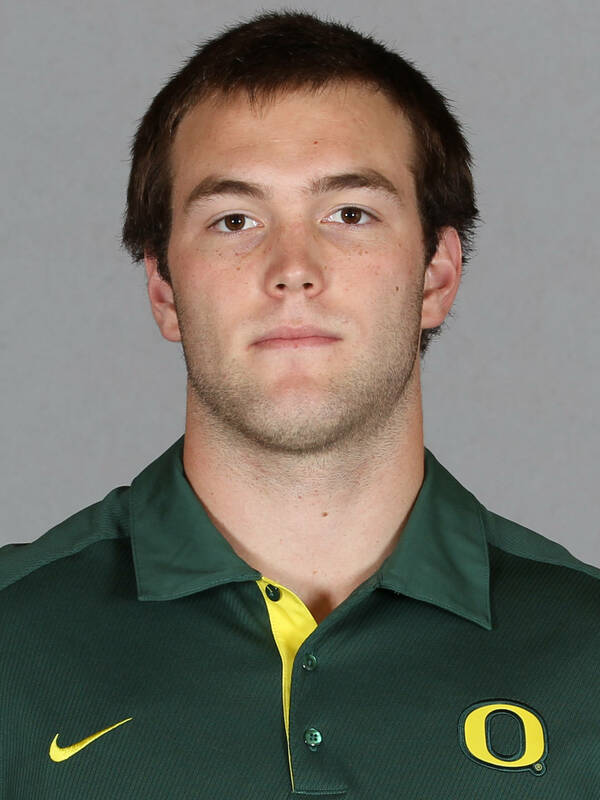 . . Named as defensive first team punter All-Region in 2012 . . . Picked as the punter for the 2011 preseason All-Region team . . . Made the All-Region second team defense as a punter in 2010. 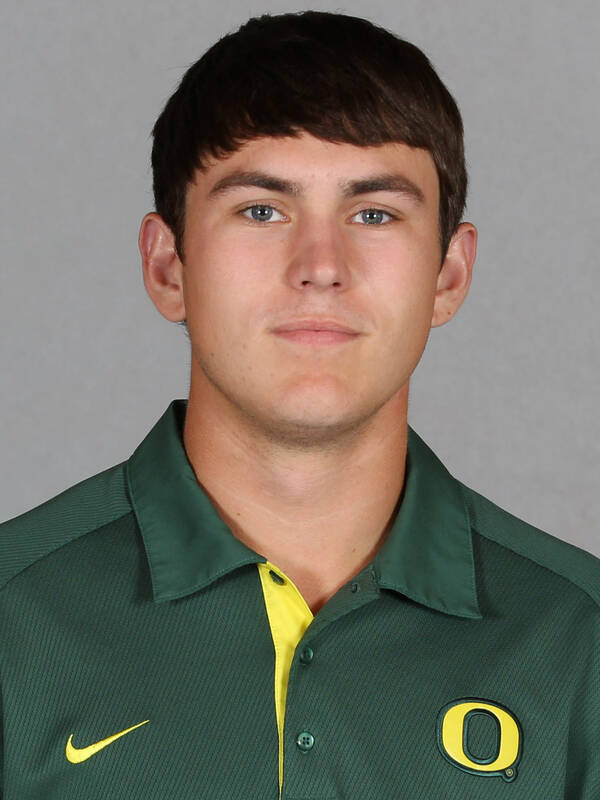 2013 — Came in as starting long snapper during all against three contests vs. Tennessee, Virginia, and Nicholls. 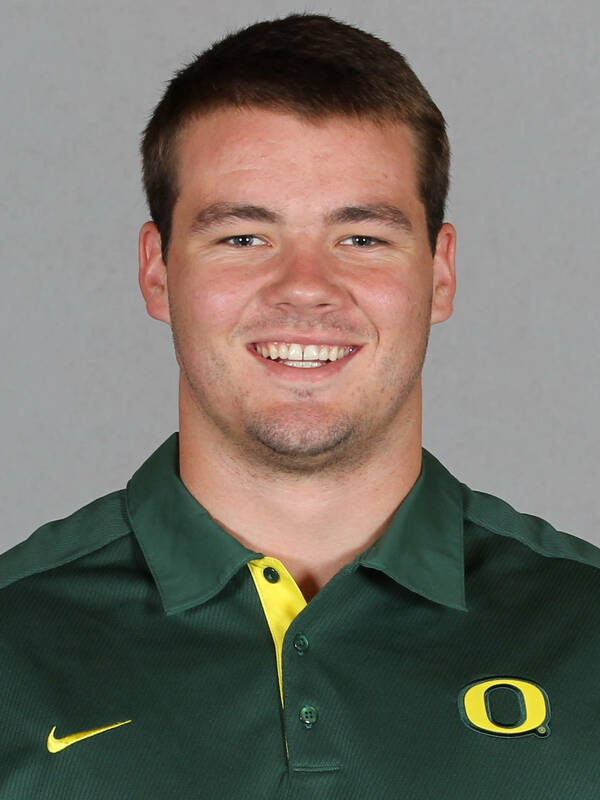 2012 — Team’s long snapper on punts appeared in 12 of 13 games … Made one solo tackle in win at Arizona State . . . Bench pressed 345 lbs. at conclusion of 2013 off-season workouts. 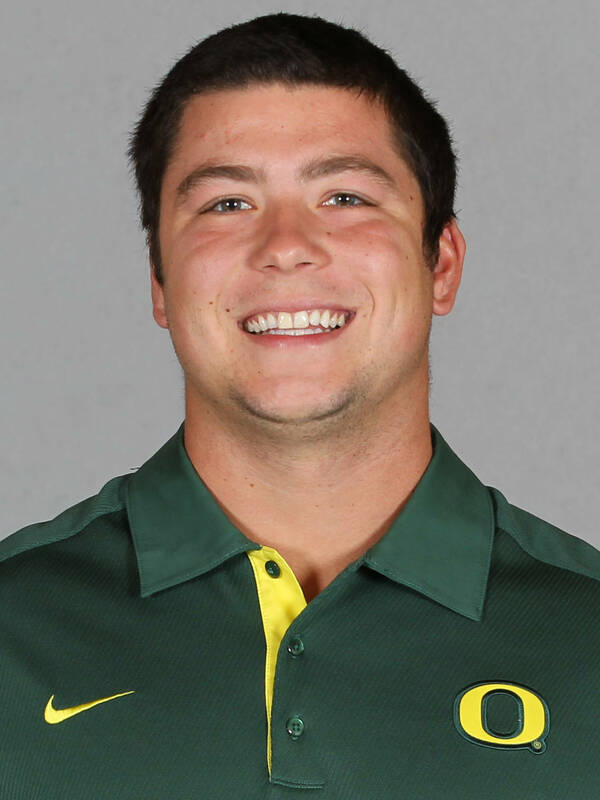 2011 — Appeared in 12 games as the team’s long snapper on punts. 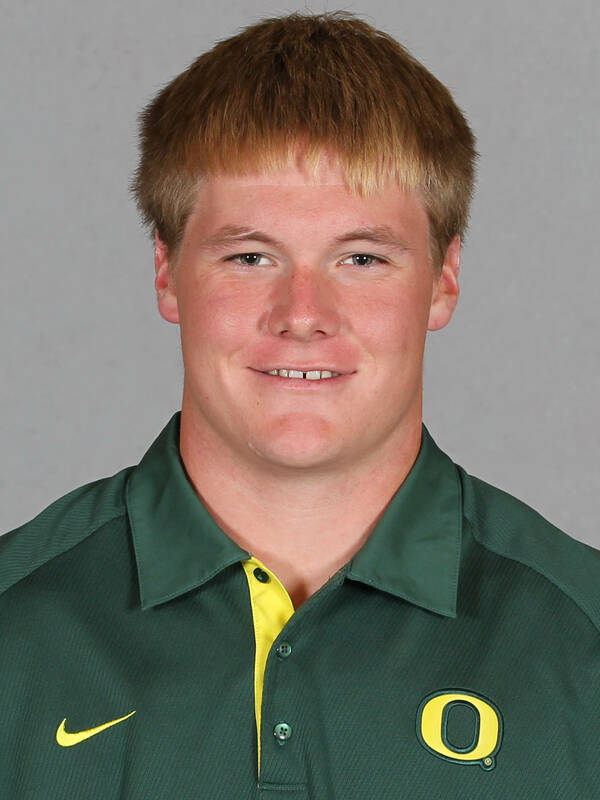 2010 — One of three true freshman to play a prominent role, taking over long snapping duties upon arriving in Eugene … Appeared in every game except the season opener as no punts were attempted vs. New Mexico … Made his debut in win at Tennessee, snapping on all four of UO’s punt attempts. BEFORE OREGON — Played running back and middle linebacker for Coach Carl Posey at Silverado High School … Earned Desert Sky League Defensive Player of the Year as a senior … Finished his senior season with 105 tackles and 8.5 sacks … Also named to All-Desert Sky League Football Team as a running back in 2011 … Named to All-Desert Sky League Football Team (offensive line) in 2010 … 2010 Daily Press Football Defensive Athlete of the Year … Earned Presidential Academic Award. 2012 — Redshirt season, worked primarily on the scout team . . . Recorded three tackles in the Spring Game . . . Tested among best linebackers, posting a 450-lb. squat. 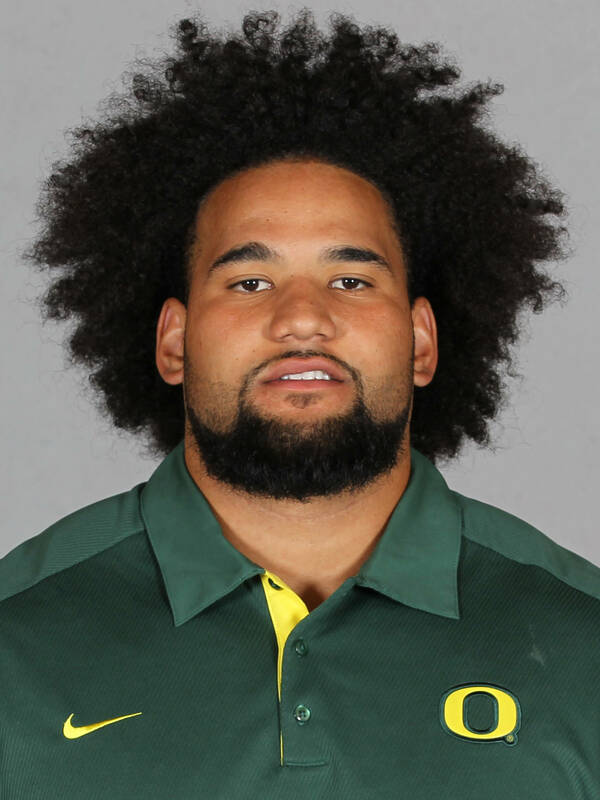 BEFORE OREGON — The two-way standout and three-year letterman recorded 91 total tackles, including six sacks and 10 tackles for loss . . . Rushed for 659 yards on 66 carries and hauled in 27 receptions for 373 yards, scoring a total of 10 touchdowns as a senior . 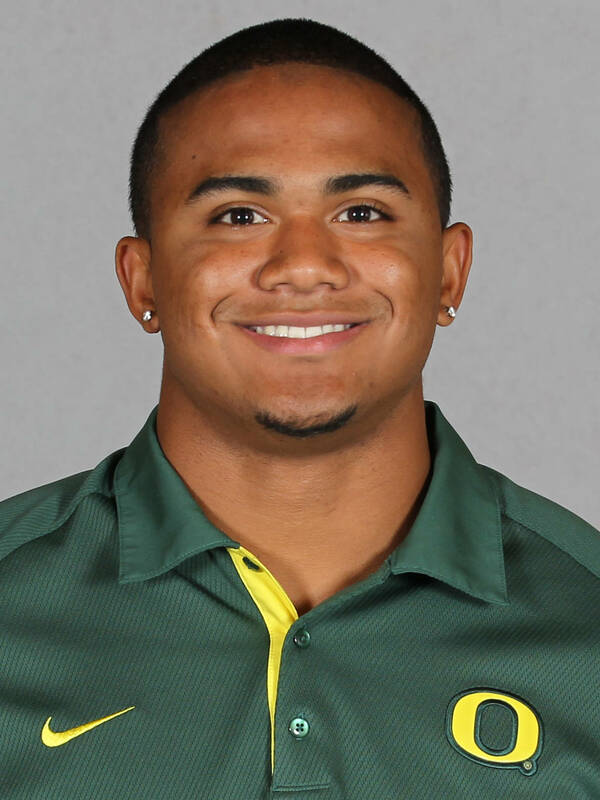 . . Named to the all-state first-team at linebacker and was the Northwest Oregon Conference defensive player of the year . . . Selected second-team all-NWOC at running back . . . Invited to “The Opening” at the Nike campus, a football camp featuring 150 of the nation’s top high school players . . . Lettered three years in baseball. 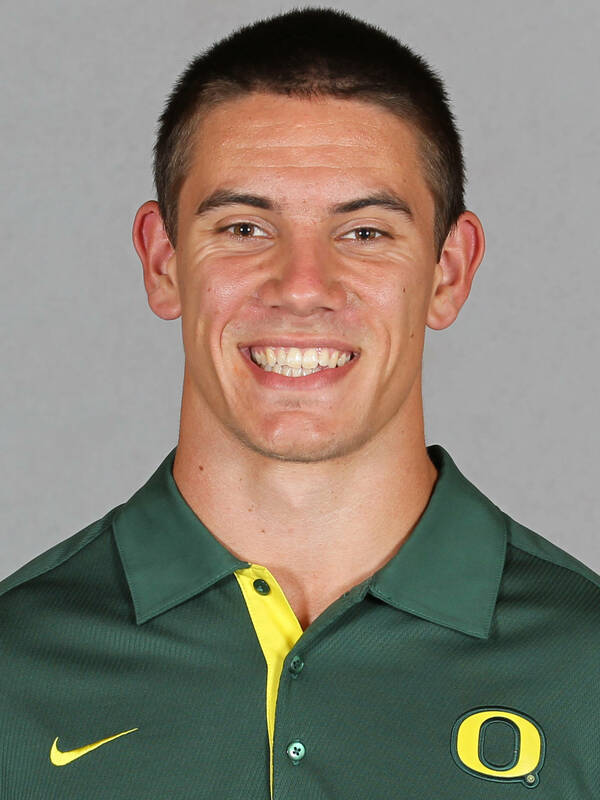 2013 — Making the transistion to the starting punter this season, the special teams member also shared the primary slot for placekicker and was the top reserve kickoff specialist in all three matchups this season . . . Has accumulated 22 points on 13 kicks and two field goals thus far . . . Reached career-highs of 256 yards on six punt attempts, which includes a personal-best longest punt of 63 yards during the victory over Cal to beat his previous best 164 yards on four punt attempts at Virginia. 2013 — The wide receiver made appearances in all four games of the season so far . . . Made one reception for three yards against Cal and one at Virginia for a gain of eight yards. 2013 — Recorded a solo takedown in both the win over Cal and the season opening win over Nicholls. 2012 — Redshirt season … Worked on scout team . . . Posted two solo tackles in the annual Spring Game. all-conference and honorable mention Class AA all-state, both at defensive end … Logged 11.47 in the 100 meters during his senior year. 2013 — Came off the bench in the opening matchup against Nicholls as a defensive back, posting a pair of pass breakups during his appearance. 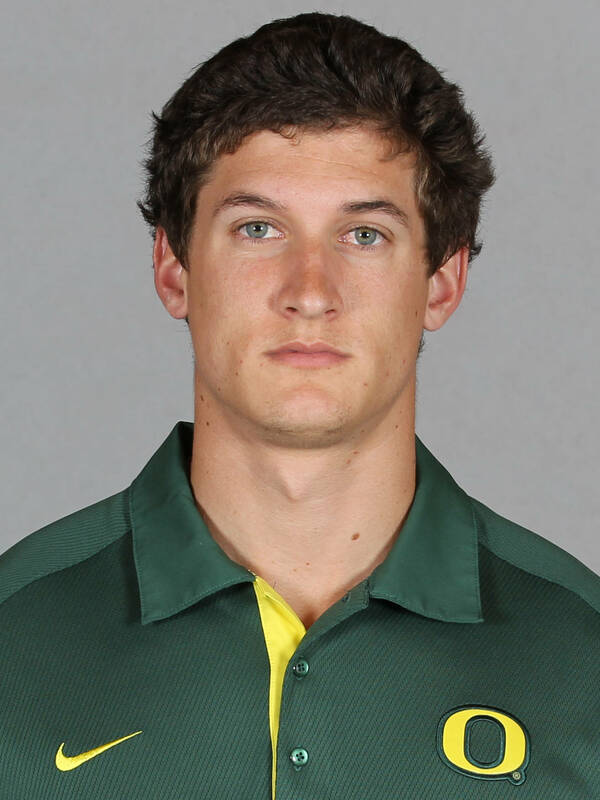 2012 — The walk-on saw action in two games, taking snaps vs. Tennessee Tech and Colorado. 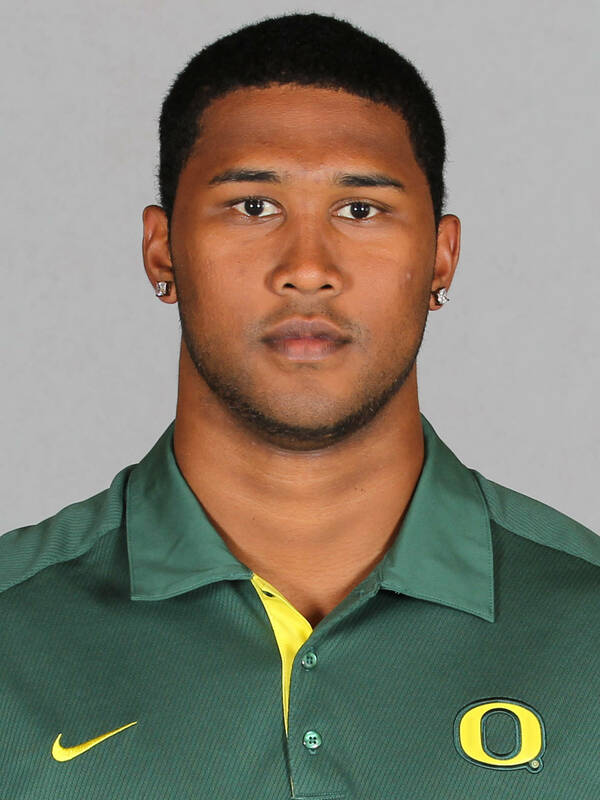 2011 — Refined his skills while spending time on the Ducks’ scout team during his redshirt season. BEFORE OREGON — Helped lead the Crusaders to a state championship in 2010… Named to the school’s honor roll his senior year. 2013 — Came in off the bench as a primary defensive end reserve in all four games . . . Contributed three assisted stops in the win over Cal ... Credited with two solo tackles in the victory against Tennessee . . . Had two stops, including one solo takedown in the season opener victory against Nicholls. 2012 — Appeared in nine of the first 10 games, primarily on special teams … Credited with first collegiate tackle in win vs. Arizona before returning to duplicate effort at Arizona State. 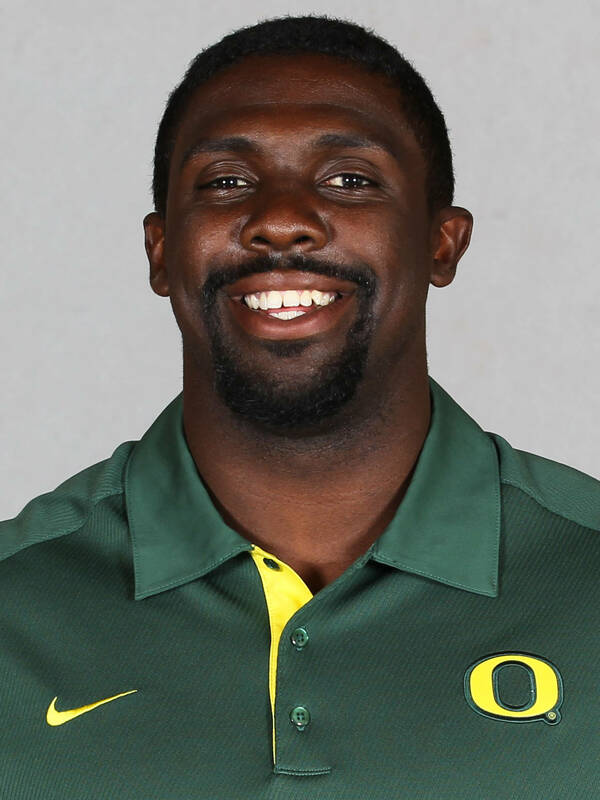 BEFORE OREGON — The two-year letterman recorded 63 tackles and 7.5 sacks on the defensive side of the ball while adding 28 receptions for 437 yards and nine touchdowns as a tight end his senior season … Helped team to 9-3 record (7-0 in conference) under head coach and former NFL All-Pro linebacker Hardy Nickerson … An all-Hayward Area Athletic League performer on both offense and defense as a senior … Posted 25 total tackles and 4.5 sacks to go with six catches for 89 yards and a touchdown as a junior. 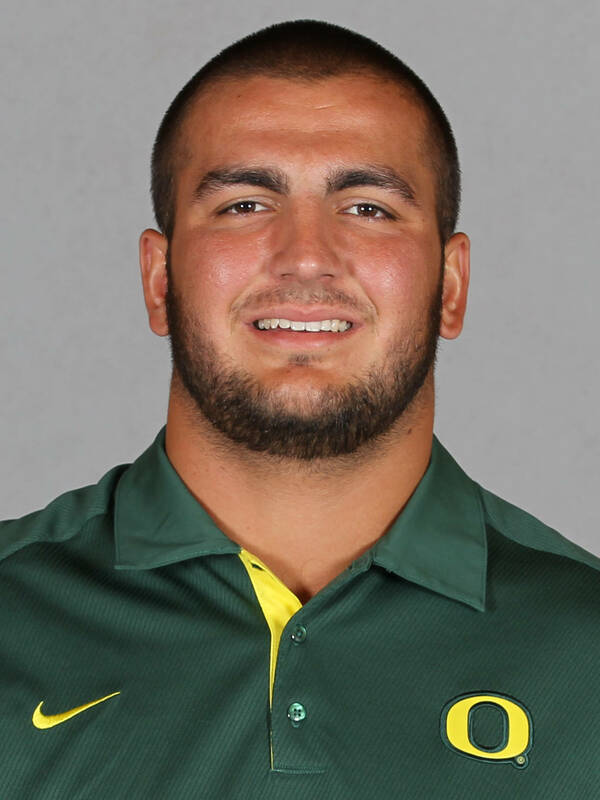 BEFORE OREGON — The three-year letterman ranked as a four-star prospect according to ESPN.com and 247sports.com, and listed 16th among the nation’s elite tight ends by Scout.com and 18th among outside linebackers . . . The second-ranked recruit in the state caught 25 passes for 365 yards and six touchdowns his senior year . 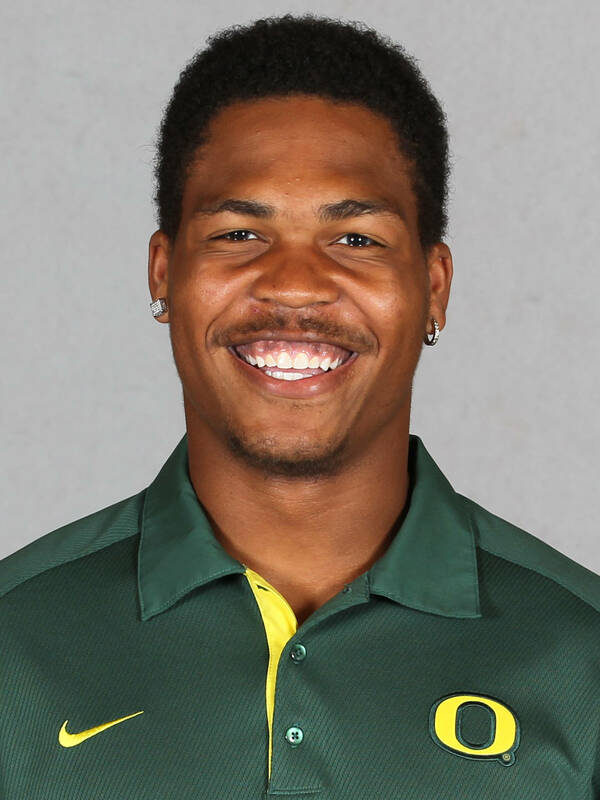 . . Also recorded 117 tackles, 14 tackles-for-loss, six sacks and four interceptions in 2012 before competing in the 2013 Offense-Defense All-American Bowl in Houston . . . Earned 2012 first-team 4A all-state accolades by the Associated Press for the Panthers, who ended the year with a 10-2 mark under head coach Sean Carty . . . Chalked up 75 tackles, 10 quarterback sacks, forced four fumbles and had five interceptions, including two for touchdowns, as a junior . . . Caught nine passes for 227 yards and three touchdowns in 2011 . . . Named Greater Spokane League defensive player of the year and first-team all-defense his final year after sharing league defensive MVP honors the previous season . . . Also earned honorable mention Class 3A All-State honors by The Associated Press at linebacker and tight end as a junior. 2013 — Saw action as the starting linebacker in all four games of the season . . . Had six total stops in the win over Cal (three solo, three assisted) ... Completed two stops and a fumble recovery during the win over Tennessee . . . Made a career-first interception in the victory at Virginia, in addition to recording four tackles and two pass breakups. 2012 — Appeared in nine games, including 42 snaps in season opener vs. Arkansas State … Nine of 11 tackles were unassisted and included one stop for a loss of 1 yard at USC . . . 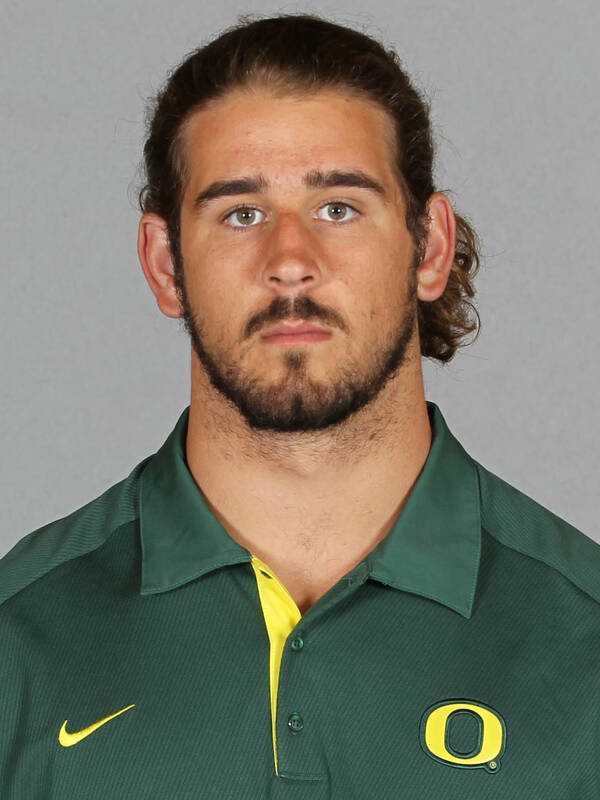 Credited with a season-high four tackles (all solo) against Tennessee Tech and added two stops vs. Arkansas State (along with a quarterback hurry) and Oregon State . . . Made one unassisted tackle in the Fiesta Bowl win over Kansas State. 2011 — Member of the travel squad … Did not appear in any games. 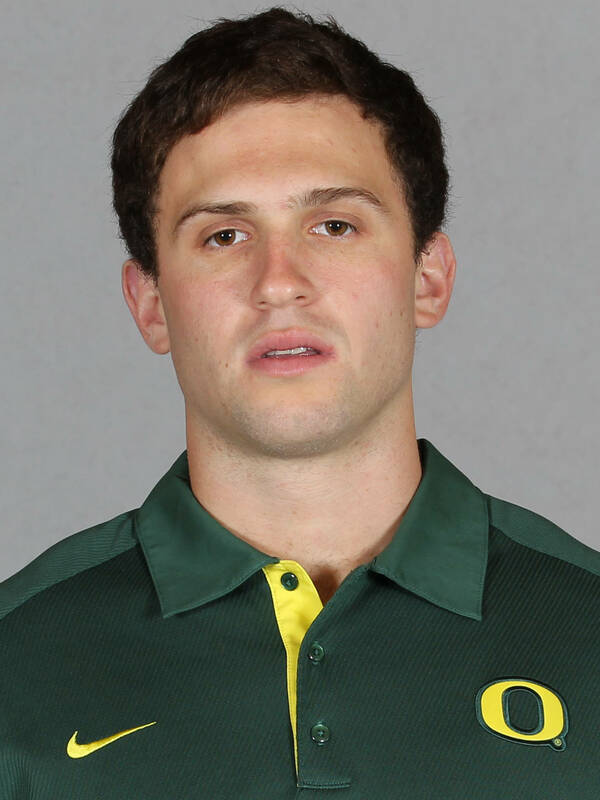 2010 — Filled in for Rob Beard in the season opener vs. New Mexico and delivered what turned out to be a Pac-10 season-high for kickers with 18 points on 3-for-4 FG attempts and nine PATs … Converted field goals from 24, 29 and 30 yards and tied UO record by converting 11 consecutive place kicks (FG or PAT) in a single game … Nine PATs vs. Lobos tied modern Oregon record. 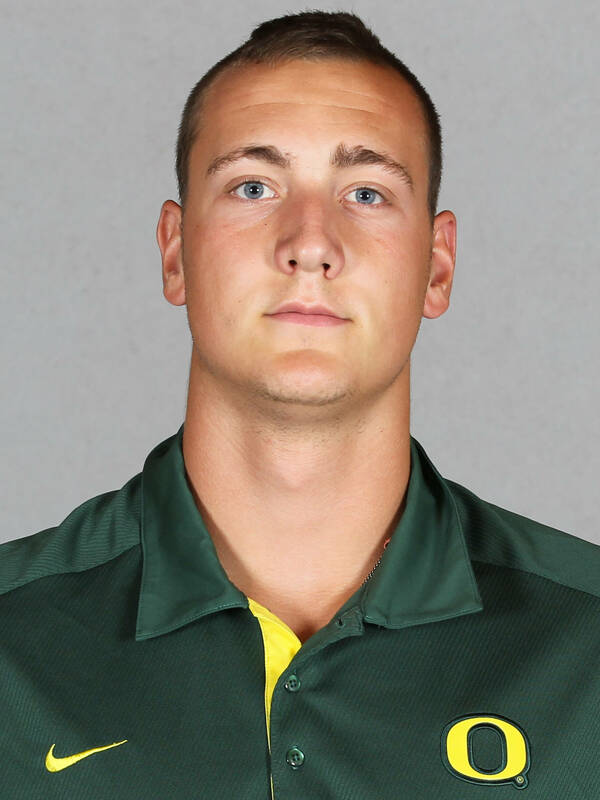 2013 — The only true freshman to start in each of the three matchups has held the primary kickoff specialist role and has shared the top placekicker position on the depth chart each week so far . . . The special teams member posts an average of 61.4 yards on kickoffs, recording a total of 1903 yards covered . . . The team's fifth leading scorer (13 points) has completed 10 of 11 kicks after a score and successfully connected a sole field goal attempt vs. Tennessee, knocking through the first try of his career from 38 yards out. 2013 — Appeared in the first two games of the season, recording one tackle each in the wins over Virginia and Nicholls. 2012 — Appeared in six games, posting tackles on three occasions … Took part in 18 snaps in two of team’s first three games against Arkansas State and Tennessee Tech . . . Credited with two tackles, including an assist for a one-yard loss in win vs. Colorado … Recorded one solo stop in victory over Washington … Contributed two stops in win vs. Tennessee Tech. 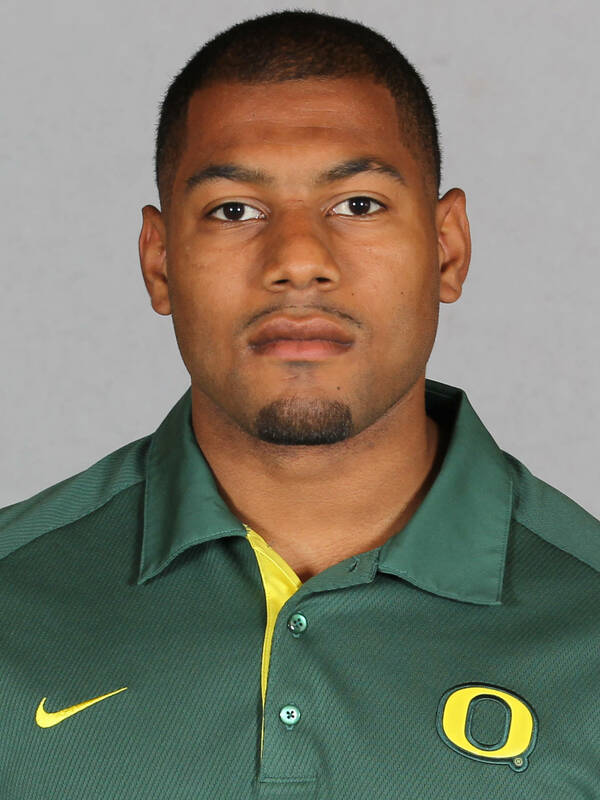 2011 — Made the most of limited playing time, recording two sacks in four appearances … Had first career forced fumble and one sack for a loss of 7 yards in victory vs. Oregon State … First career sack for a loss of 8 yards in win at Colorado … Had one tackle in win over Missouri State … One solo stop in victory vs. Nevada. 2013 — Has made appearances in each of the first four games ... Contributed two solo takedowns in the win over Cal ... Recorded as having atleast one tackle in the victories against Tennessee, Virginia (2), and Nicholls. 2012 — Forced a fumble and had one solo tackle in win at Arizona State … Added one tackle vs. Washington in one of 12 appearances … Posted career-high two stops in win over Tennessee Tech … Recorded one stop in victory vs. Arkansas State . . . Accumulated four tackles and one interception for 3 yards in the Spring Game . . . Tested a best of 525 lbs. squat following off-season workouts. 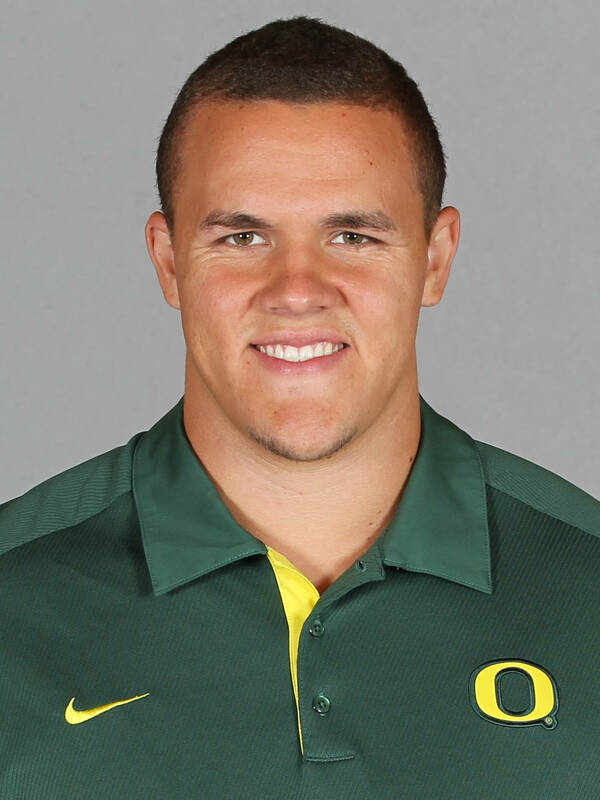 2011 — Appeared in two games … Made first tackle of collegiate career in victory over Nevada. BEFORE OREGON – Had a career total of 734 receiving yards, 63 catches and 10 total touchdowns … Helped lead the Sheldon Irish to become state champions in 2012 as a senior linebacker and slot … Ended his senior year with 590 total receiving yards and seven touchdowns … Named second team all-state as a linebacker in 2012 … Irish also won state championships his freshman season … Earned four letters playing baseball for the Irish under head coach Ron Lampe as 1B/OH … Played in two games during his baseball career finishing with a career batting average of .250, one RBI and one hit … Lettered three years on Sheldon’s basketball team under head coach Stan Manley as post/guard … Played in a total of eight games with three points and 14 rebounds. BEFORE OREGON – Lettered his junior and senior years playing center and long snapper … Played in a career total of two games with three total tackles … Named second-team offensive unit and special teams player of the year his senior year … Also lettered for three years as middle blocker on Oaks Christian’s volleyball team under head coach Chris Forrest and George Hess … Earned the academic honor of making the Headmaster’s List his senior year. 2013 — Transistioned to the team's primary this season, the key offensive component held off opponents at right guard in all three wins of the season. 2012 — Appeared in all but one game as a top reserve at both guard positions and now ready to push for a bigger role . . . Eclipsed 50 snaps in each of his first two games before participating in a career-best 59 plays in the win at Oregon State . 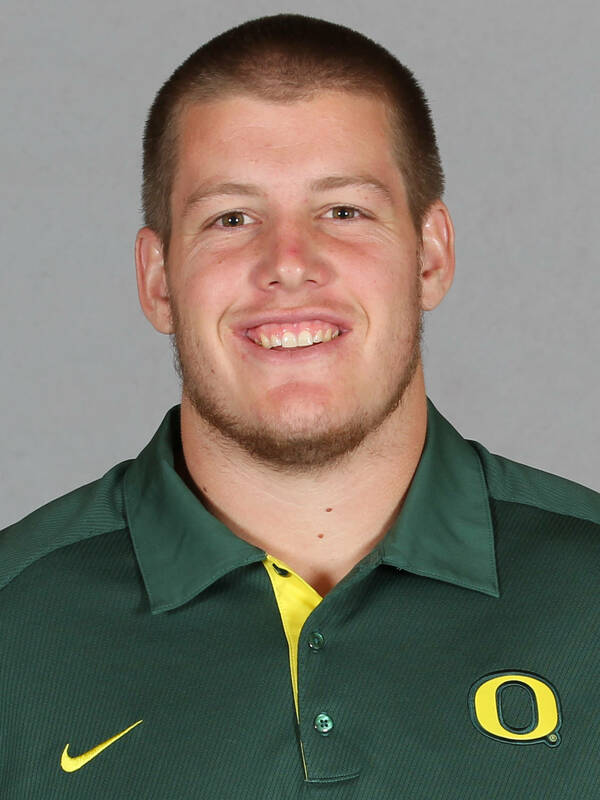 . . Has displayed versatility to play either side of the line after first arriving as a center . . . Led all offensive linemen with a 395-lb. bench press. 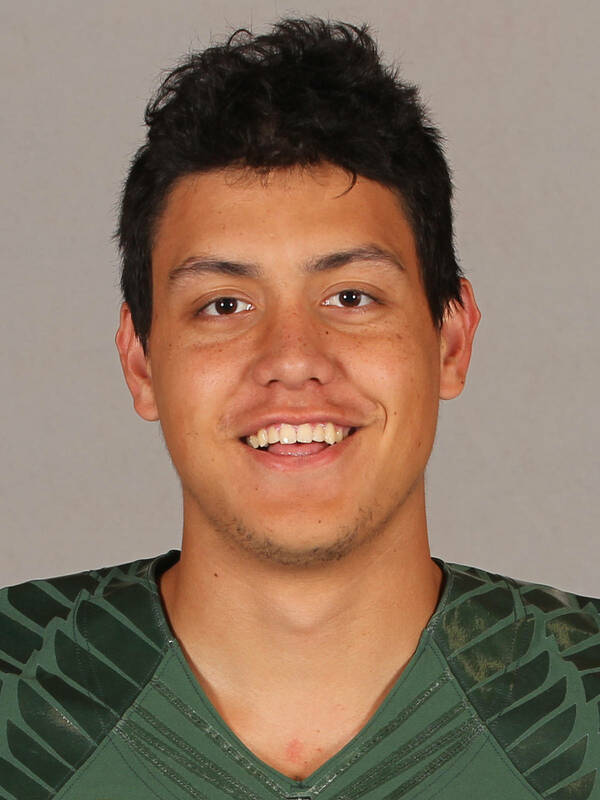 2011— Appeared in eight games, including four conference contests and the Pac-12 Championship Game … Played a season-high 24 snaps in win at Colorado. 2009-10— Collegiate career temporarily interrupted due to religious mission commitment. 2013 — Helped the team outscore their first three opponents as the starting center on the offensive line. 2013 — Saw action as a primary defensive tackle reserve during the first three wins of the season, recording atleast two stops per game . . . Had a career-best of three tackles, including a separate single-game high of two solo takedowns vs. the Cavaliers, and also was credited with a fumble recovery. 2012 — Appeared in the final four games of the season when health of his teammates negated the luxury of a redshirt year . . . 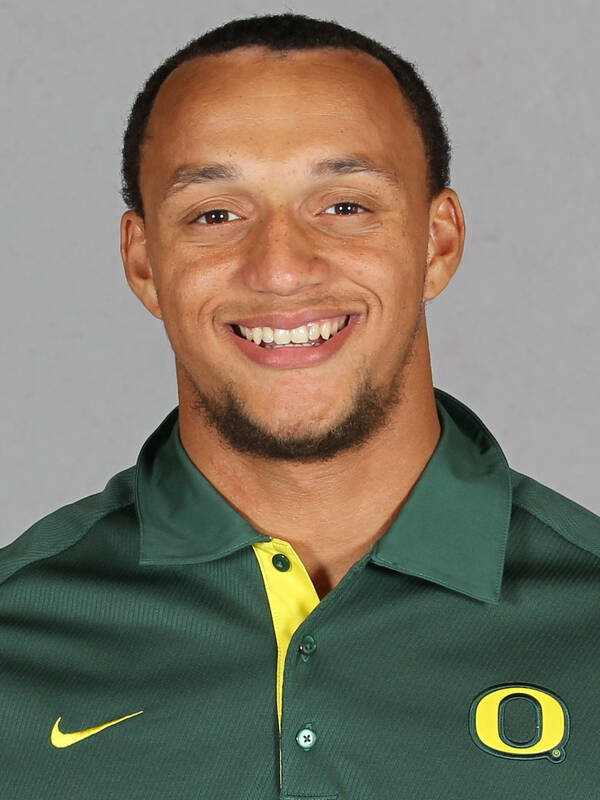 Included was a starting nod vs. Stanford … Made first collegiate tackle in victory at Oregon State … Debuted in team’s 10th game of the season at California . . . 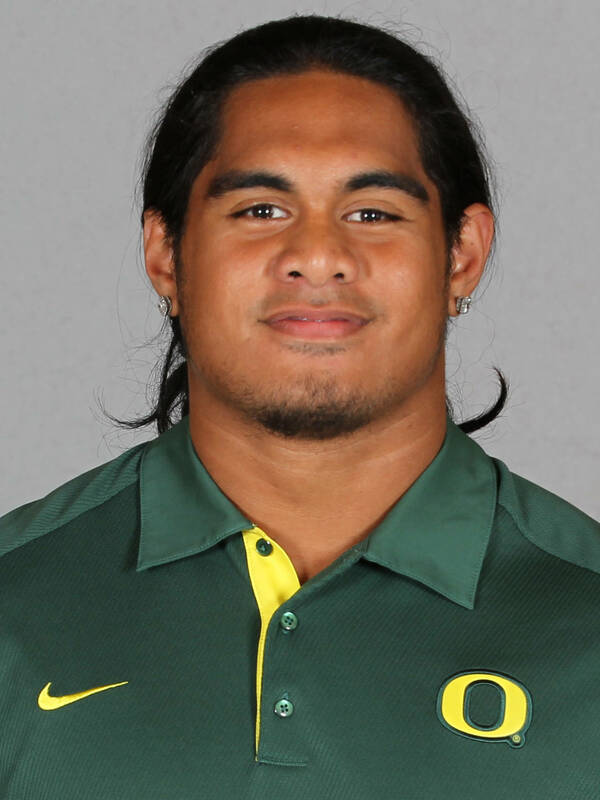 Credited with two solo tackles in Spring Game, including one tackle for loss. 2013 — The linebacker came off the bench to see action in the season-opening victory against Nicholls. 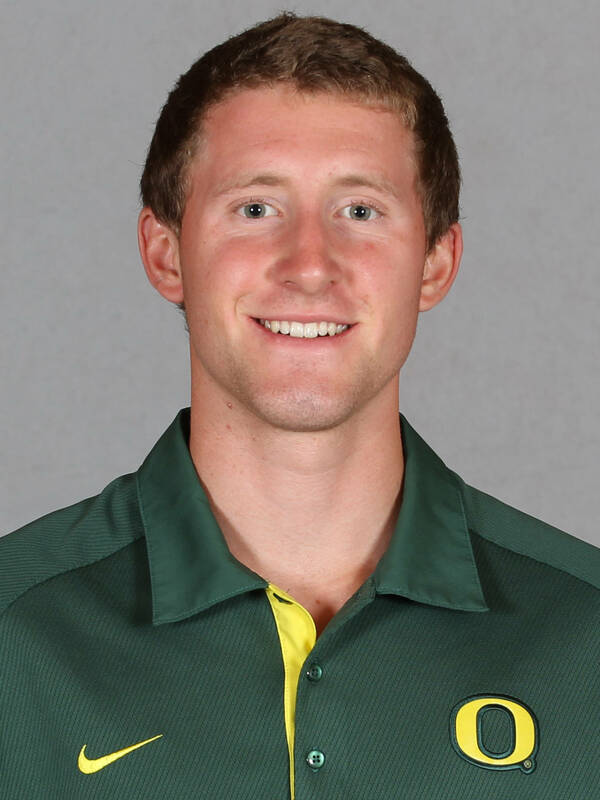 2012 — Worked on improving skills on Ducks’ scout team in addition to making four game appearances . . . Recorded one tackle-for-loss for 1 yard in 2013 Spring Game . . . Timed in 5.08 in electronic 40 meters and 4.22 in shuttle run. 2011 — The walk-on utilized a redshirt season. BEFORE OREGON — Named North Bay League second-team defensive lineman his senior year before earning conference’s defensive line honorable mention the previous year … Earned three letters in football and track … All-city champion in the 100 meters, long jump and anchor of the 4x100 relay … Named Most Valuable Athlete of the Year on the league championship track team his final year. 2012 — Saw action in all 13 contests, including appearance in the Fiesta Bowl win over Kansas State . 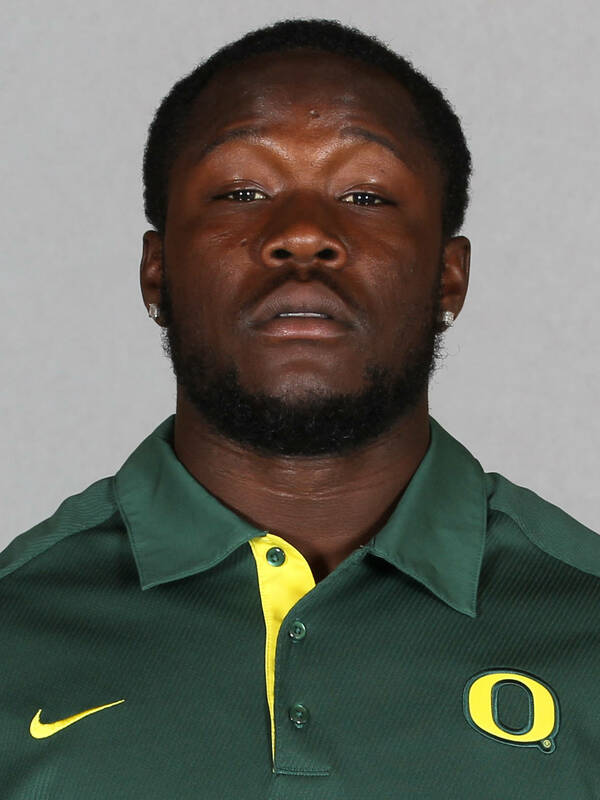 . . Logged 66 snaps at Oregon State and 29 vs. Colorado. 2011 — Worked on the scout team during redshirt season. BEFORE OREGON — A three-sport athlete at Aloha High School, competing in football, basketball and track & field … A three-star recruit according to Rivals.com, Scout.com and 247Sports.com … PrepStar Magazine All-West Region … Received honorable mention from the Tacoma News Tribune on their annual list of “Northwest Nuggets” … Helped lead Warriors to the 2010 OSAA 6A Football State Championship … Selected to the all-state offensive first team as a tackle by The Oregonian … Blocked for an offense that rushed for 4,452 yards (318.0 per game) and 52 touchdowns … On defense, made 40 tackles, six sacks and had one fumble recovery … Recorded 54 tackles and three sacks as a junior. 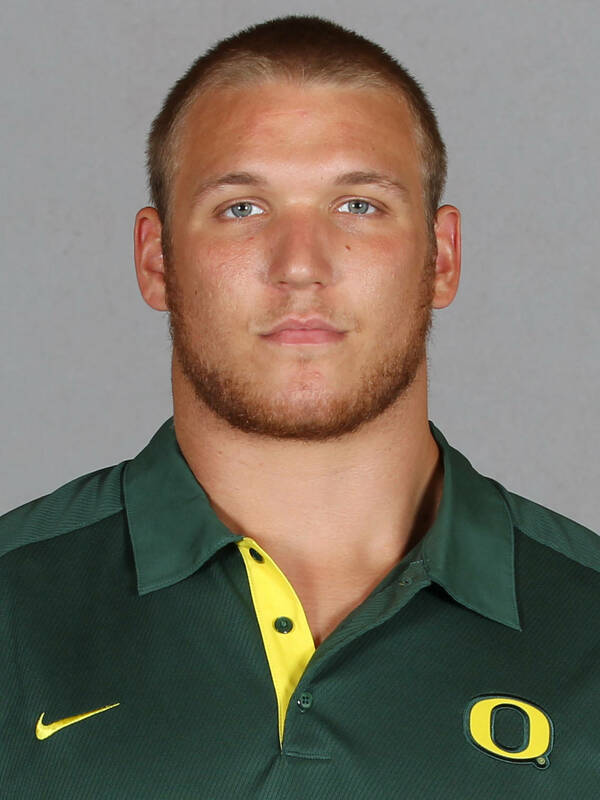 2013 — Has made an appearance in all four games of the season, posting an assisted stop in the win over Cal, a solo takedown at Tennessee and an assisted stop at Virginia as a linebacker. 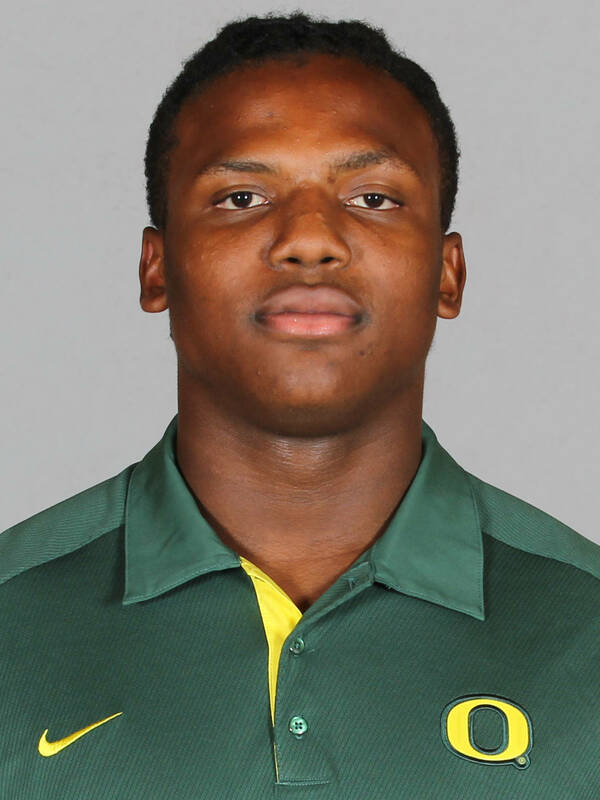 2012 — Saw action in career-best five games, benefitting from nine snaps against Tennessee Tech … Enjoyed his first multiple-tackle game of his career with two unassisted tackles in victory over Colorado … Made first collegiate stops in win vs. Arkansas State before adding another two weeks later against the Golden Eagles . . . Earned one of program’s Scout Team awards (defense) for second year in a row . . . 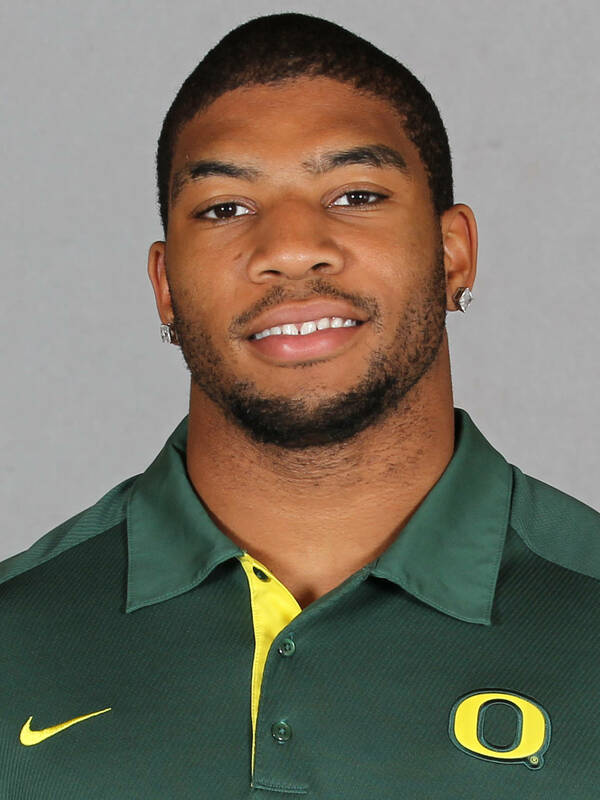 Credited with five tackles in team’s 2013 Spring Game . . . Second among linebackers with 500-lb. squat. 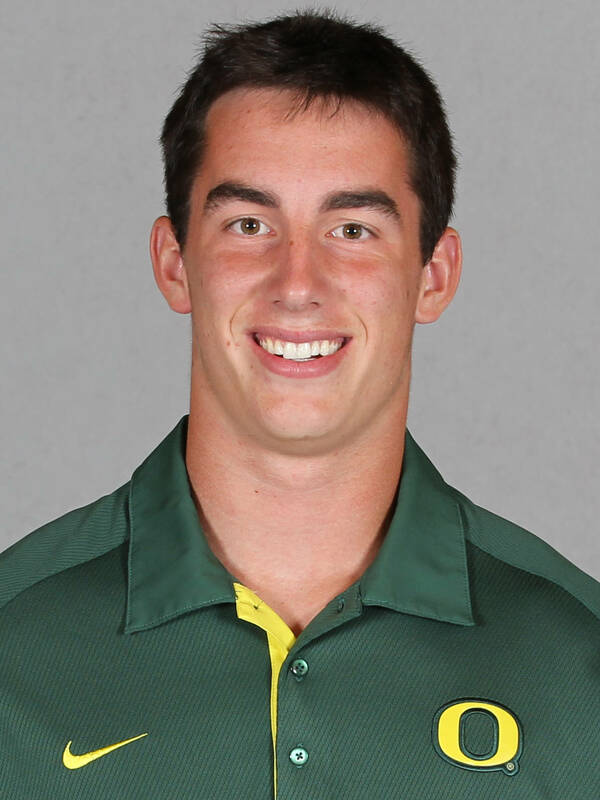 2011 — Scout team Player of the Year on special teams … Appeared in two games. 2010 — Participated as a member of the scout team during his redshirt year. 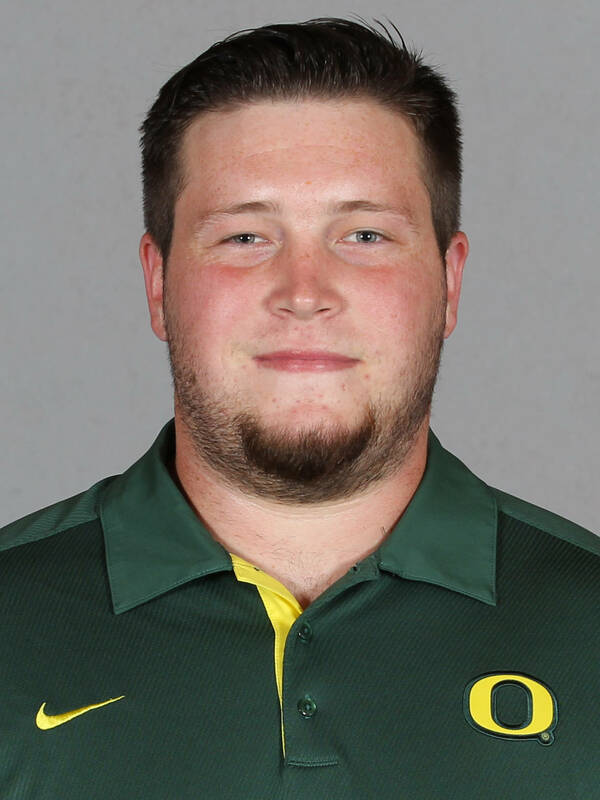 BEFORE OREGON — Key guard and center on the Musketeers' varsity squad in 2011 and 2012. . . Named to the All-Conference first team in 2012 . . . Made the Ventura All-County first team as well as the All-Marmonte team as an offensive lineman his senior year. . . Attended the National Underclassmen Combine in 2012 and after finishing as one of the top 5 linemen in the Nation, qualified for their Top 100 Elite Prospect Camp . . . Stats include a 5.22 40-yard dash, 4.87 shuttle, 28" vertical, 7'11" broad jump, bench max of 365, squat max of 450, and clean max of 285. 2013 — Saw action on the offensive line in all three winning games of the season so far. 2012 — Made appearances vs. Arkansas State, Tennessee Tech and Colorado . . . Most extensive playing time occurred in lone Pac-12 action, taking part in 13 snaps. 2011 — Worked with the scout team. 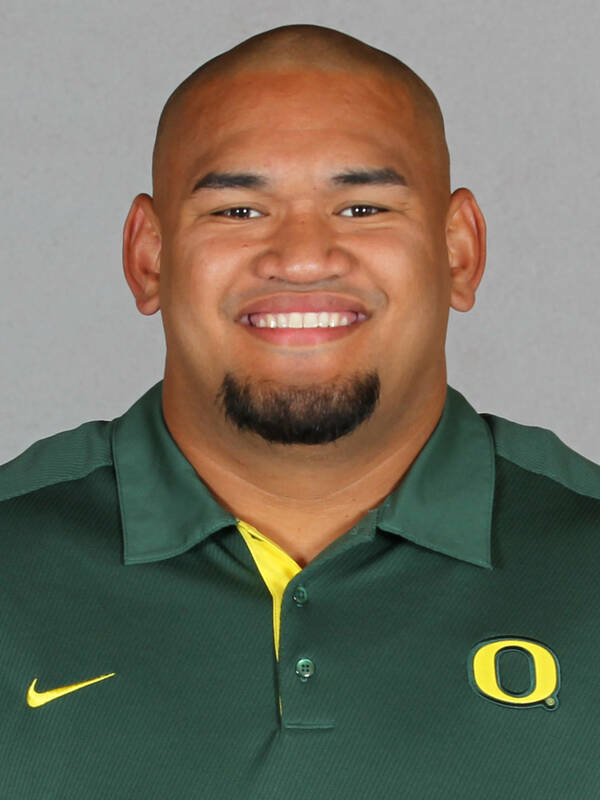 BEFORE OREGON — Played football at Jesuit High School under head coach Ken Potter where he was named to second-team Metro League as an offensive lineman his senior season. 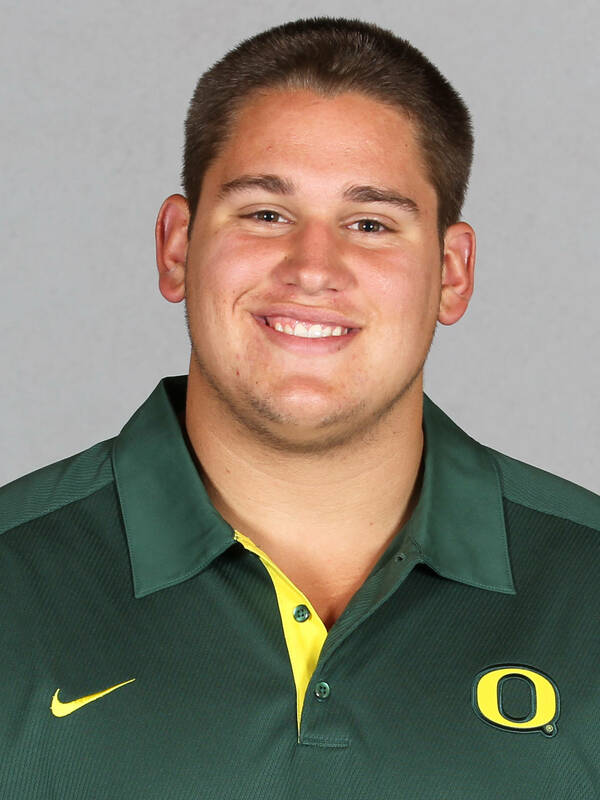 2013 — Started on the offensive line as a guard for the first three games of the season, helping the Ducks to see victories against Tennessee, Virginia and Nicholls. 2012 — Appeared in first eight games of the season, starting at right guard in wins at Arizona State and vs. Colorado . . . Displayed rapid improvement as season wore on before injury derailed his progress . . . Participated in 48 snaps in the season-opening win over Arkansas State and 47 at Arizona State . . . Secured recognition as Pac-12 Academic All-Conference honorable mention . . . Posted offensive line’s second-best bench press (390 lbs.) during off-season testing. 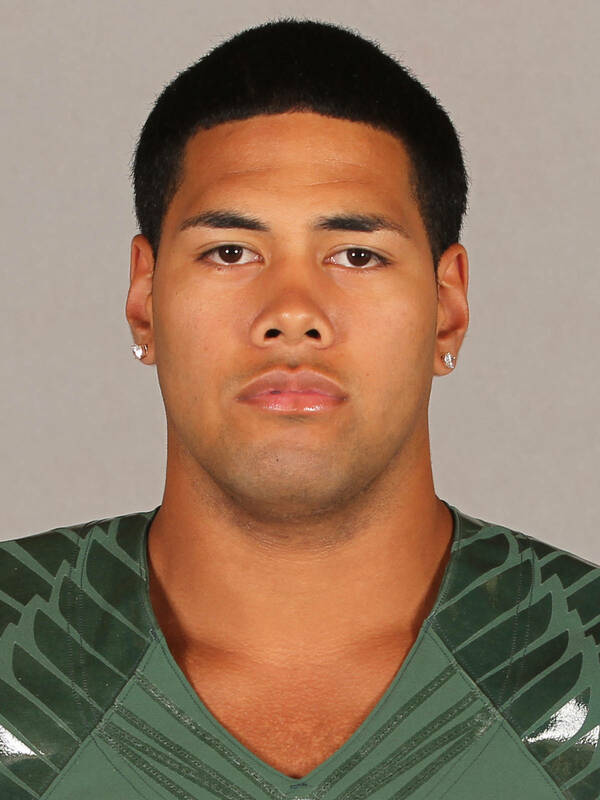 2011 — Appeared in six games, playing a season-high 35 snaps in win over Oregon State. 2012 — Afforded Freshman All-America acclaim after making his collegiate debut in season’s opening win vs. Arkansas State and remained as a left tackle starter for all 13 games . . . The youngest member of an interior line that paved the way for an offense ranked third in the country in rushing (315.23) and second in scoring (49.54) enroute to a Fiesta Bowl triumph over Kansas State . . . Earning first-team Pac-12 all-conference acclaim by one publication, helped lead the way for a unit that elipsed 400 yards on the ground on four occasions and shared the nation’s lead in rushing touchdowns (48) . . . Athletic ability epitomized by driving USC defender to the outside to allow Kenjon Barner to cut back and and score a fourth-quarter 30-yard TD run . 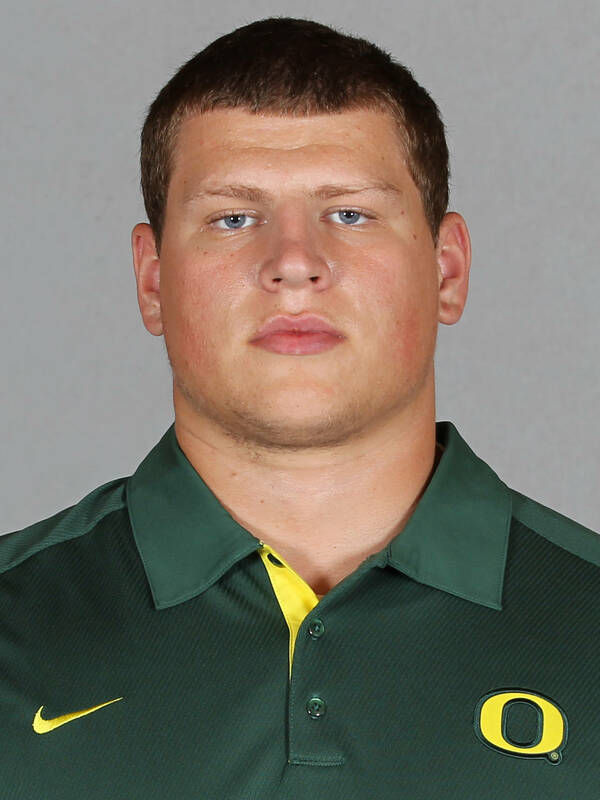 . . One of only three players to earn Oregon Elite status for improvement in every phase of off-season conditioning (power, strength, speed and agility) compared with previous year . . . Combined three separate lifts to clear over 1,100 lbs. to go along with 31-inch vertical leap. 2013 — Made appearances on the offensive line in all three contests of the season so far. 2012 — Saw action against Tennessee Tech and Colorado during the regular season but greater contribution has come from being willing to assist where needed . . . Shifted from tight end to the offensive line during spring drills. 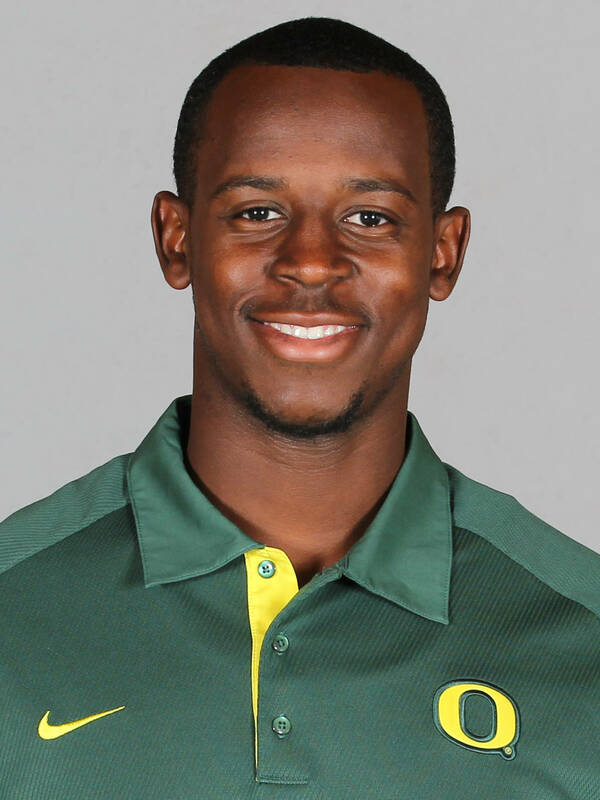 2011 — Appeared in seven games, including three conference tilts and the Pac-12 Championship Game vs. UCLA. 2010 — Appeared in all three non-conference games … Played a season-high 12 snaps in win vs. Portland State … Made collegiate debut in win over New Mexico. 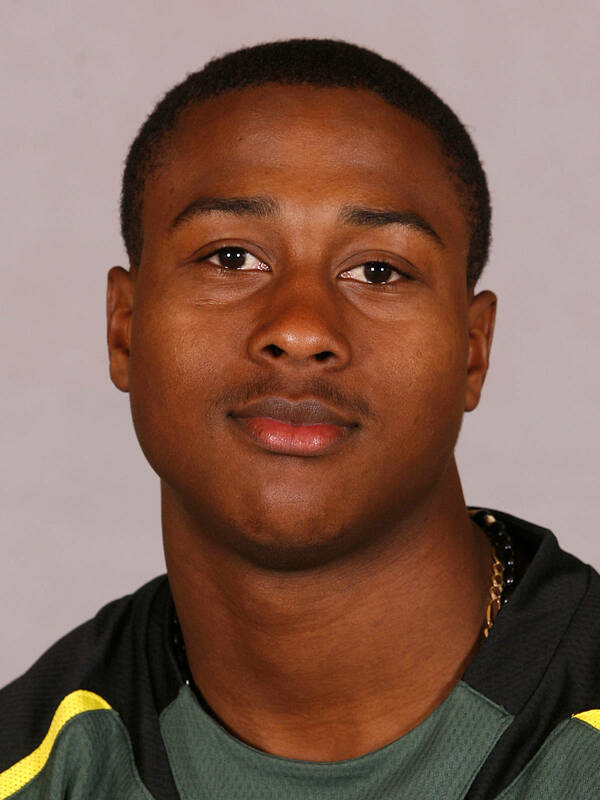 2009 — Redshirt season … Recognized as Oregon’s offensive scout team player of the year … Selected offensive scout team player of the week following the win over Washington State. 2013 — The defense's primary end has contributed 16 takedowns in the first four games (9 solo) . . . Was the third leading tackler with five tackles in the win over Tennessee, and recorded a forced fumble and a pass breakup against the Vols . . . Credited with five stops in the win at Virginia and four takesowns in the season opening win vs. Nicholls. 2013 — Saw action on the offensive line during the season-opening win against Nicholls. 2012 — Reserve lineman made appearances vs. Tennessee Tech and Colorado . . . Most extensive playing occurred against the Buffaloes, taking part in four snaps. 2011 — Worked on the scout team. BEFORE OREGON — The three-year football letterman named a three-star recruit by Rivals.com and Scout.com … Considered the No. 58 prep offensive guard prospect by Scout.com and No. 73 prep offensive tackle in the country by Rivals.com … PrepStar Magazine All-West Region … As a senior, lived up to his preseason All-Valley League selection by being named to the All-State and All-Valley League first teams at season’s end … Helped pave way as Eagles rolled up 2,036 rushing yards and averaged nearly six yards per attempt in 2010 … As a junior, garnered second-team All-Baseline League honors as an offensive lineman. 2011 — Worked as a member of the scout team. 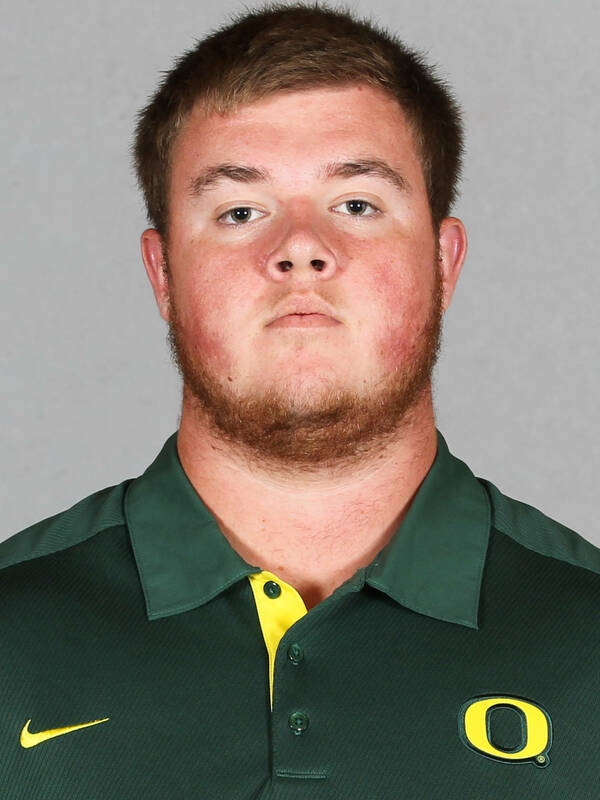 BEFORE OREGON — Two year letterwinner in football at West Linn High School under head coach Ron Chappell earning class 6A all-state honorable mention … As a senior, named to Three Rivers League first team. 2013 —The linebacker made a first career appearance in the season-opening victory against Nicholls. 2012 — The walk-on joined the Ducks following the first game . . . Improved skills as member of the scout team. BEFORE OREGON — Helped lead team to 2009 North Coast Section championship as well as Marin County Athletic League championships all three seasons . . . Also competed in the shot put and discus throw for three years. 2013 — The secondary came off the bench to see action on the offensive line as a guard in wins over Tennessee, Virginia and Nicholls. 2012 — Team’s top reserve on right side of the offensive line played in all 13 games, including starting assignments in wins over Tennessee Tech and Arizona State . . . Most extensive playing time of year was 51 snaps in opener vs. Arkansas State. 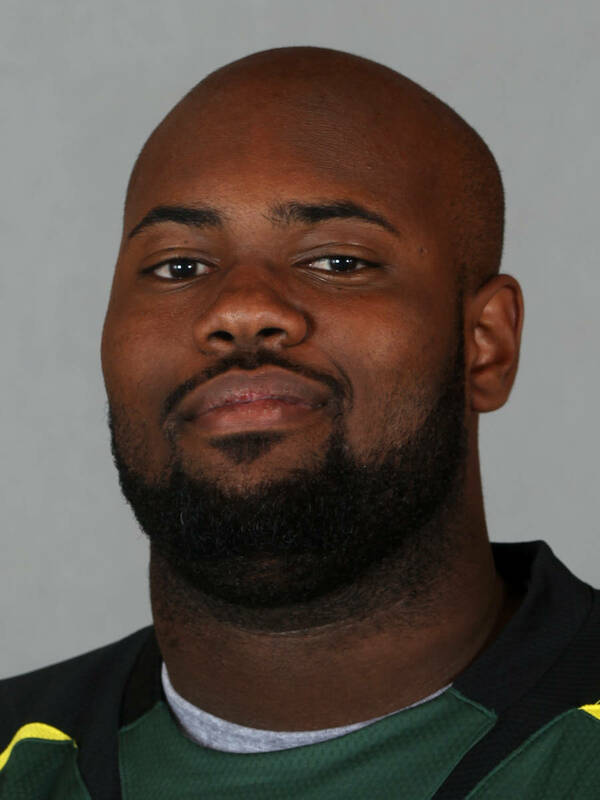 2011 — Appeared in all 14 games off the bench, primarily at right tackle … Played 20 or more snaps in four games, including a season-best 37 in win vs. Missouri State. 2013 — Came off the bench as as the top left guard reserve, holding off the opponents on the offensive line in all three matchups of the season. 2012 — Appeared in four games during the season, including 15 snaps vs. Tennessee Tech and 13 against Colorado . . . Majority of development took place due to the repetitions acquired via the scout team. 2011 — Worked as a member of the scout team his redshirt year. 2013 — Was the primary right tackle in wins against Tennessee, Virginia and Nicholls. 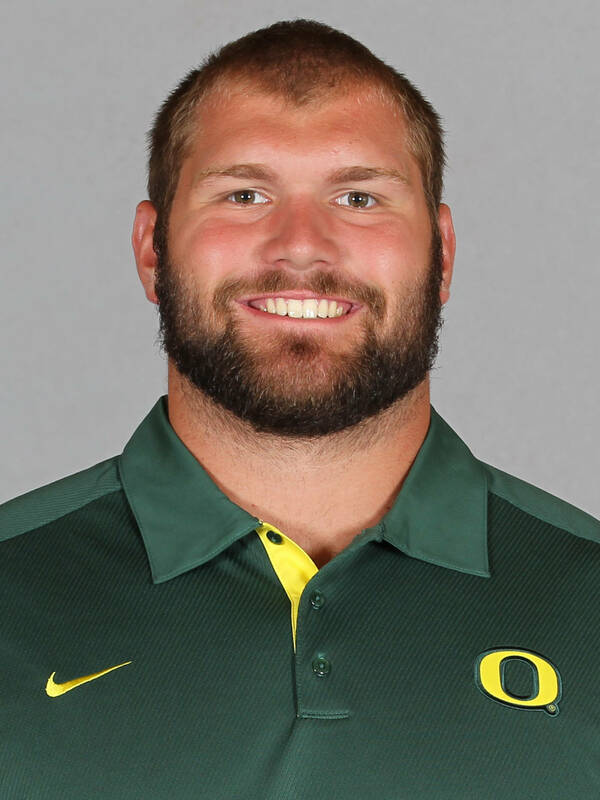 BEFORE OREGON — Wasted little time making the successful transition to the offensive line for his senior season after spending his first three years as a tight end . . . Displayed the strength and footwork to transcend into one of the state’s more dominating forces in the trenches . . . Tabbed by ESPN.com as a three-star prospect as well as the nation’s 19th-best offensive lineman by Scout.com . . . Credited with keying an offensive line that provided protection for a core of quarterbacks who accounted for second in the West Jersey – National Football Standings in passing (1,291 yards) in 2012 . . . The Renegades’ offense also ranked second in the New Jersey Division South Group 4 in touchdowns (24) . . . Despite his inexperience in the trenches, received first-team all-Burlington County plaudits (Burlington Times), as well as second-team all-South Jersey and New Jersey Group 4 attention . . . Also posted 13 tackles as a senior defender . . . 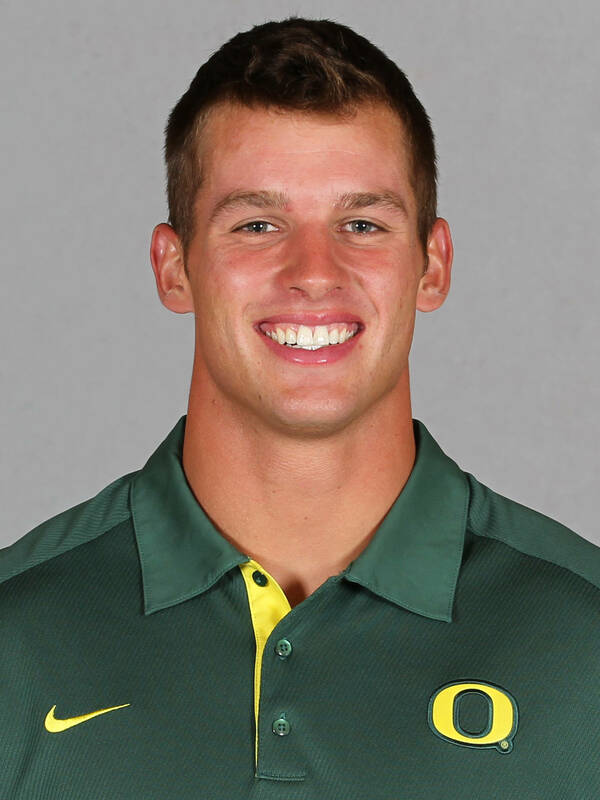 He is the son of former NFL quarterback Joe Pisarcik . . . Shawnee High School posted a 6-5 record under head coach Tim Gushue in 2012. 2013 —One of six true freshmen to see action this season, the primary reserve came off the bench to contribute to the offensive line as right tackle in the first three contests vs. Tennesee, Virginia and Nicholls. 2013 — Made appearances on the offensive line as the secondary center in all three opening victories against Tennessee, Virginia and Nicholls. 2012 — Came off the bench as the primary reserve at center to appear in career-high nine games . . . Tested among team’s strongest offensive linemen following off-season workouts, clearing 330 lbs. in clean, 545 lbs. squat and 360 lbs. bench press. 2011 — Appeared in eight games … Played a career-high 43 snaps in win over Missouri State. 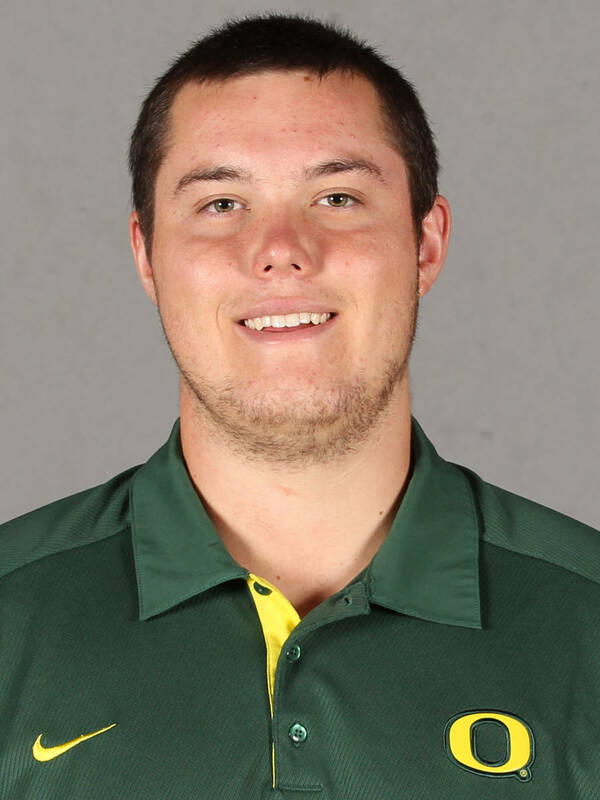 2010 — Made lone appearance in win vs. Portland State … Tops among all offensive linemen in the shuttle run (4.34) and squat lift (tie - 500 lbs) during winter testing. Squat tied for top mark on the team. 2009 — Redshirted his initial collegiate season. 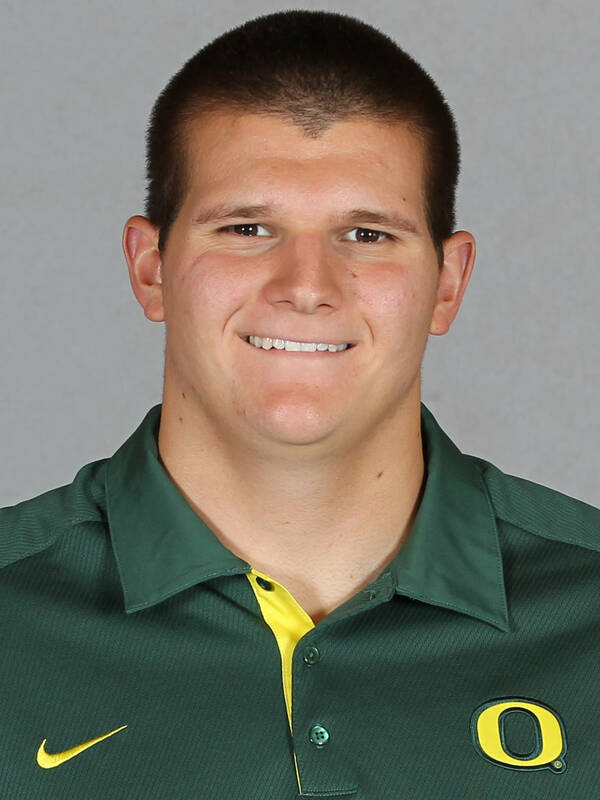 BEFORE OREGON — The four-year letterman stands as one of the more decorated offensive linemen in a deep contingent of signees in the trenches for the Ducks . . . The four-star standout according to ESPN.com, Rivals.com and Scout.com was included among the nation’s elite on the ESPN300 listing as the No. 9 offensive guard in the country . . . 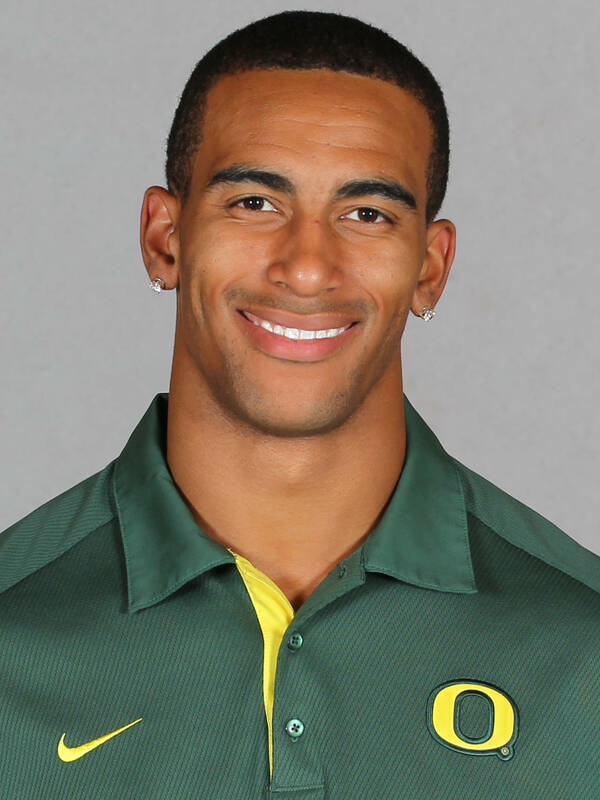 Selected to play in the 2013 Under-Armour All-America game as only Oregon’s second athlete chosen to participate . . . One of the state’s top two college prospects (Rivals.com) was a two-time first-team all-Three Rivers League honoree . . . The Lions’ 2012 success was hampered due to his five-game absence due to injuries as the school finished the year with a 4-7 record under head coach Mike Fanger and an opening-round elimination from the Class 6A state playoffs . . . Earned honorable mention all-state acclaim following his junior year . . . 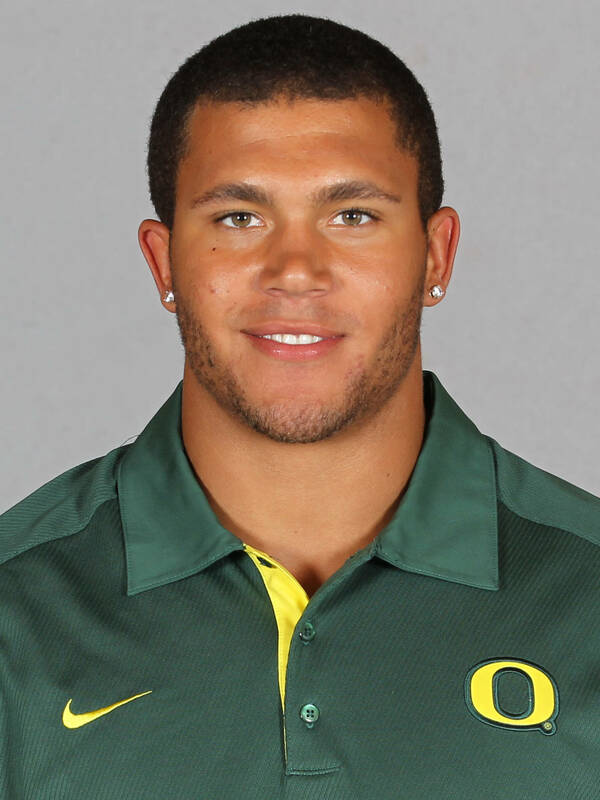 Older brother, Dallen, was a walk-on tight end at Oregon during the 2010 and 2011 seasons. 2013 — Saw action as a tight end in the season-opener against Nicholls. 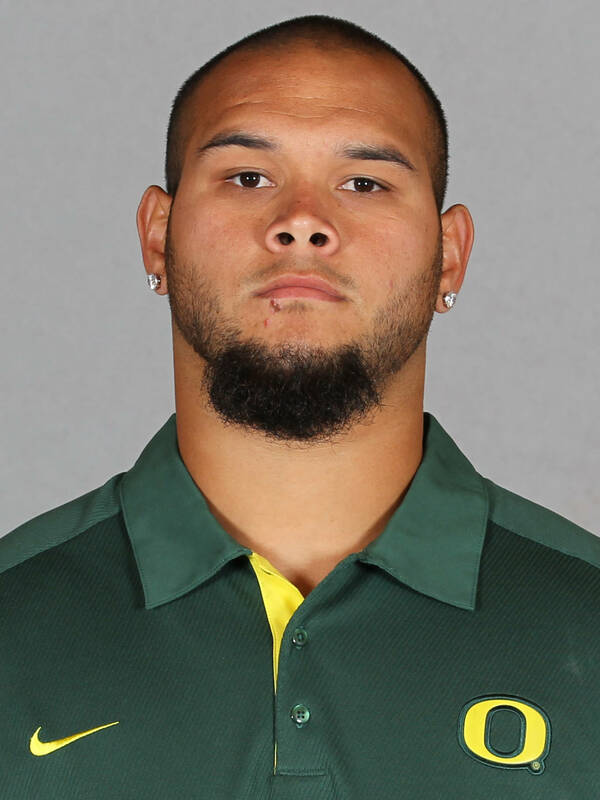 2012 — Appeared in 11 of 13 games while earning distinction as one of few Oregon players in recent years to play on both sides of the football in the same season . . . Switched from defensive line to tight end at start of fall camp and proceeded to start there vs. Tennessee Tech … Made the most of the opportunity, catching only two passes of the year for 18 yards against the Golden Eagles . . . Also added one special teams tackle . . . Returned to defensive trenches for several games late in the season when depth was thinning, contributing three tackles in win over California . . . Took part in season-high 45 snaps in opener against Arkansas State and 33 to end the regular season at Oregon State. 2011 — Defensive scout team player of the week for prep work ahead of team’s win at Washington. 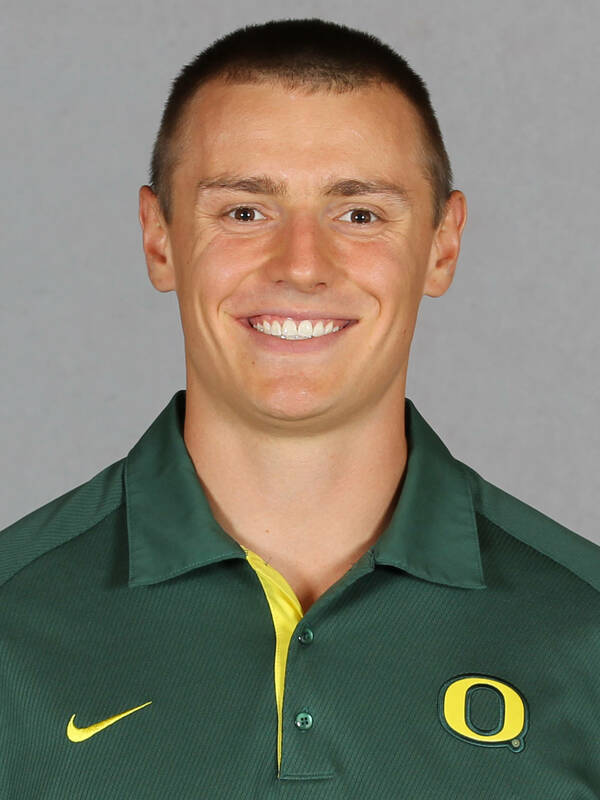 BEFORE OREGON — The letterman stood out his sole year on the Beaverton football team, which went (6-5) in 2012, catching 35 passes for 570 yards and six touchdowns as a wide receiver . . . In addition, his stats include a seventh score on a rushing play, one kickoff return for 90 yards, and two punt returns for 16 yards . . . Made the all-league third team postseason . . . Broke the all-time standing broad jump record at 10 feet 4 inches, and ran one of the fastest (40s) 4.62 and (shuttle) times 4.18 at 2013 Barton Camp/Combine . . . Hagger played basketball all four years of high school, leading the Beavers to a breakout season his senior year. . . Also named an all-league player for basketball after the 2012 season. 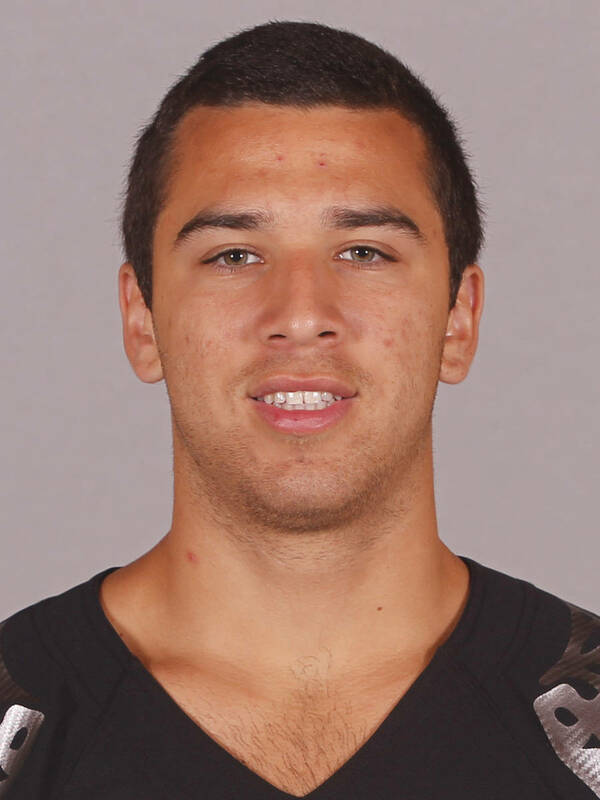 2013 — Made appearances as a primary reserve in three games and once as the first string tight end when he made his starting debut during the contest against Tennessee in which he played for a career day . 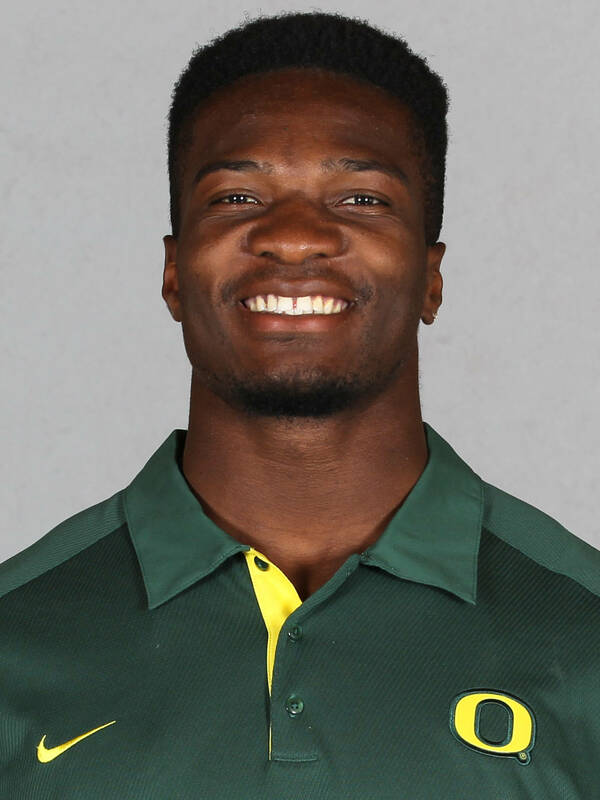 . . Had the most receiving yards by an Oregon tight end (121) since 2009 (148, Ed Dickson) and made career-firsts of five catches and two touchdowns against the Vols . . . Made a single catch to gain 28 yards in the victory over Cal. 2013 — Made appearances on the defensive line during the home victories against Cal, Tennessee and Nicholls. 2012 — Worked on the scout team during his redshirt campaign . . . Credited with three tackles in the Spring Game, including one tackle for loss for 4-yard setback. BEFORE OREGON — Spent 2011 season at Iowa Western Community College, where he played under head coach Scott Strohmeier . . . In nine games at WCC, he compiled 22 total tackles, 10 tackles for loss, and seven sacks . 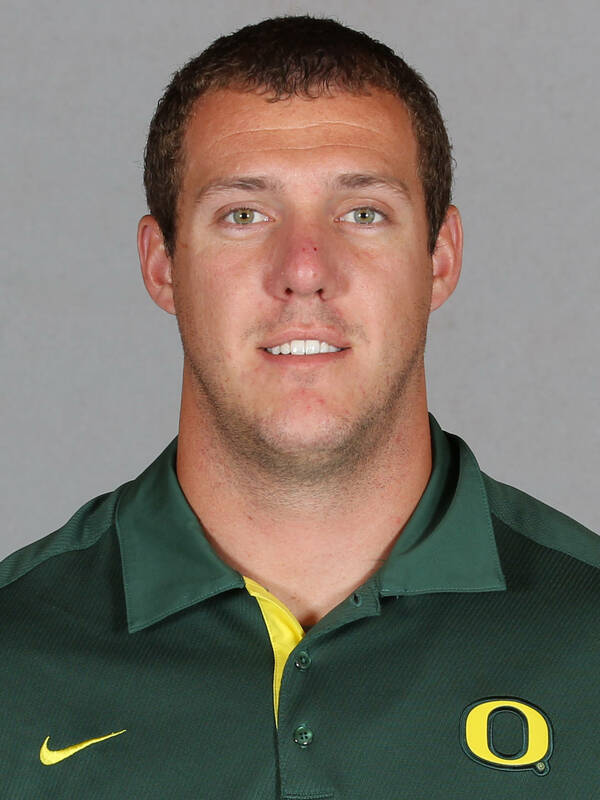 . . As a senior at South Fremont High School in 2007, he totaled 41 tackles, two blocked punts and a sack on defense while hauling in 11 receptions for 152 yards and two touchdowns at tight end . . .Embarked on two-year religious mission following high school . . . 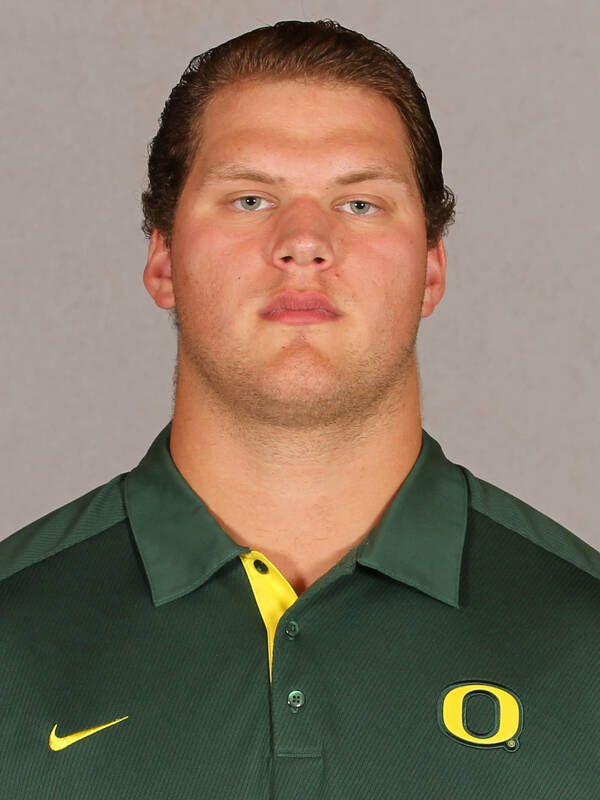 Younger brother of former Oregon defensive tackle Brandon Bair, now with the Oakland Raiders. 2013 — Made an appearance in the victory over Tennessee to pick up six yards on a punt return and four receiving yards on one catch. 2012 — Saw action in four games, including an appearance in the Fiesta Bowl win over Kansas State … Stepped onto the field for eight snaps against Colorado, returning one punt for 28 yards . . . 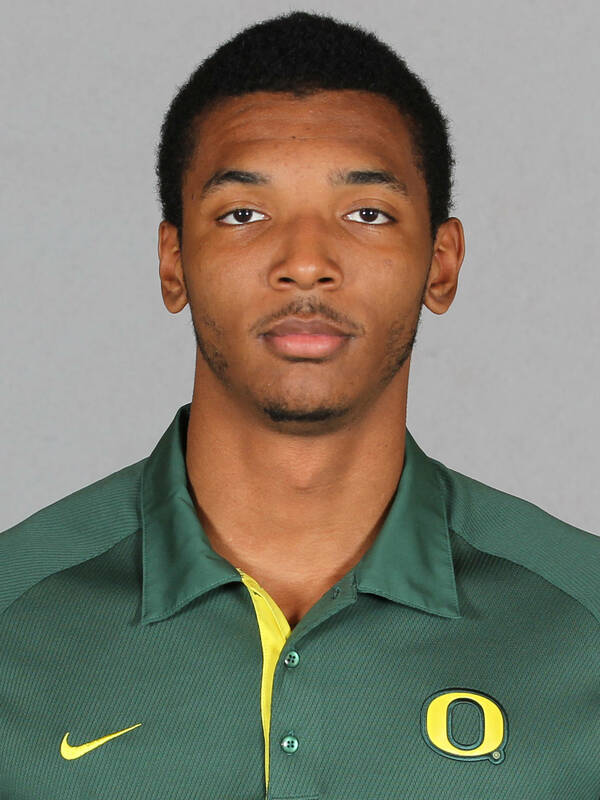 Caught four passes for 49 yards and fielded on punt for 3-yard return in 2013 Spring Game. 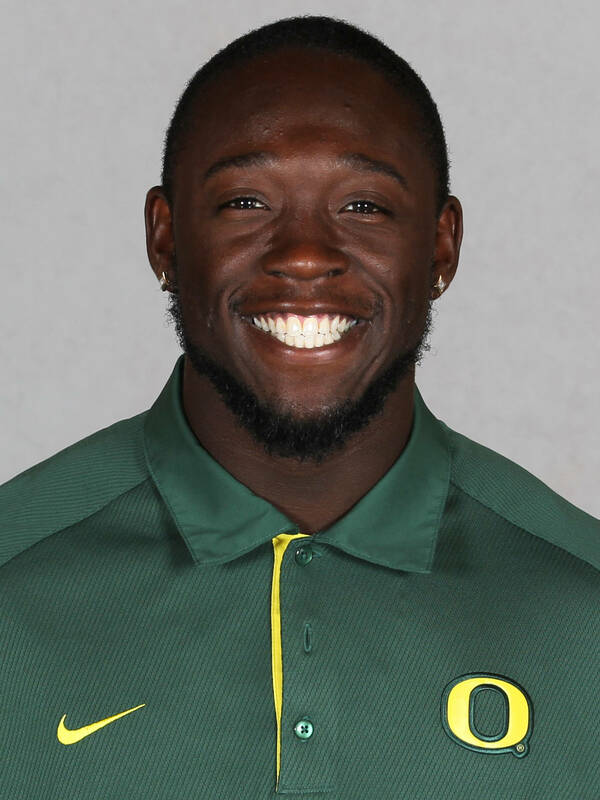 2011 — Used primarily on special teams, assisting with punt returns … Returned one punt for six yards in win vs. Oregon State … Had one punt return for five yards in victory at Colorado. 2012 — Saw action in 12 games, totaling two receptions for 42 yards … Recorded one unassisted tackle in win vs. Colorado … Had one reception for 26 yards in victory over Tennessee Tech … Made one grab in collegiate debut for 16 yards in win vs. Arkansas State, in addition to fielding one kickoff. 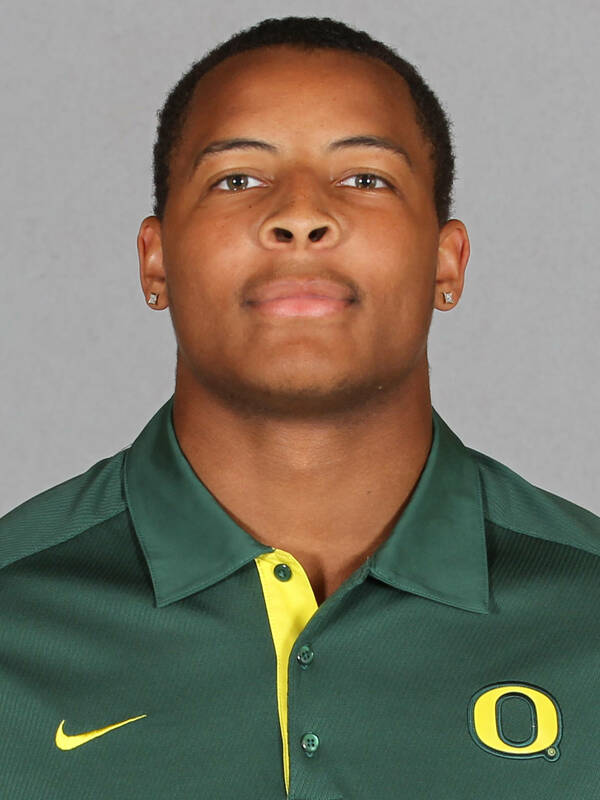 BEFORE OREGON — A two-way standout and three-year letterman played in the Offense-Defense All-American Bowl where he was named the West’s offensive MVP . . . Caught 32 passes for 753 yards (23.5 avg.) and 10 touchdowns as a senior, while racking up 12 sacks at defensive end . . . Named second-team all-Ohioan in 2011 . . . His best game on offense came against Normandy High School (Parma, Ohio), where he made seven catches for 173 yards, helping his team to a 34-0 win . . . Also a standout basketball player for the Arcs, averaging 17.4 points, 11 rebounds and three blocks per game his senior year . . . First-team all-conference and MVP as a junior, when he averaged 16.0 points and 14.0 rebounds per contest. 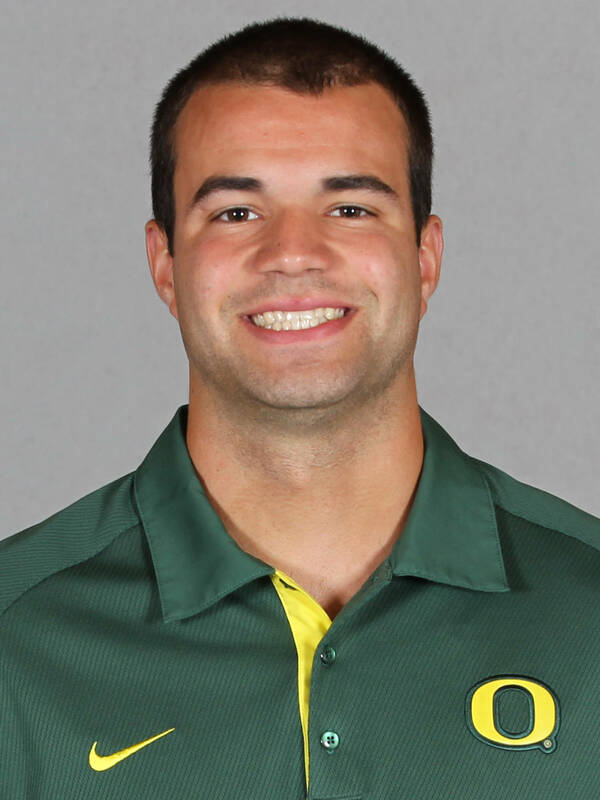 BEFORE OREGON — A two-year letterwinner at Monte Vista Christian High School for Head Coach David Reese ... Helped his team to its first Monterey Bay League Championship in 2011 ... As a senior, caught 48 passes for 924 yards and 14 touchdowns and also had seven solo tackles ... Named to first-team Monterey Bay League at wide receiver ... Also was an All-County Selection at wide receiver ... As a junior, caught 34 passes for 647 yards and seven touchdowns and made 14 tackles ... Earned a spot on the second-team Monterey Bay League team at wide receiver. 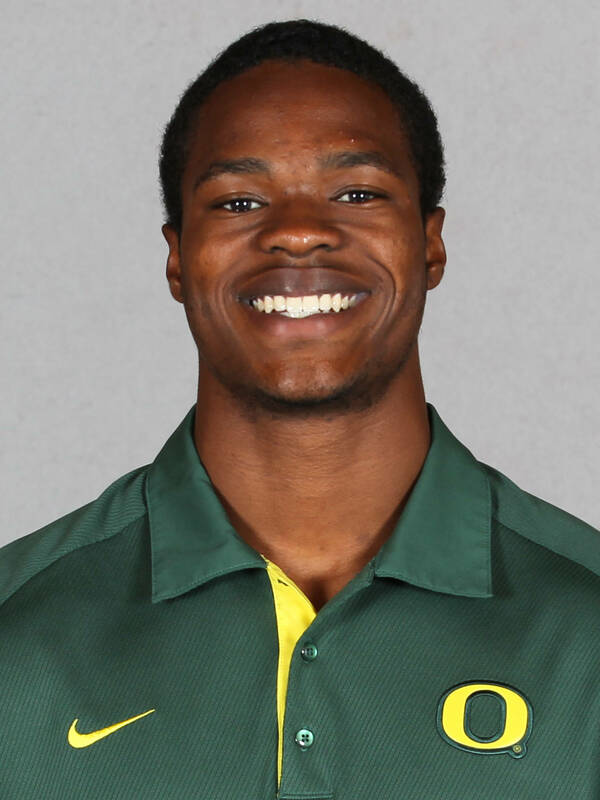 2013 — One of six true freshman to see action on the field so far this season, the reserve linebacker came off the bench in all four games of the season, posting a tackle in each appearance . . . Credited with tackle-for-loss of seven yards to contribute to five total takedowns (three solo) during his first career game against Nicholls. 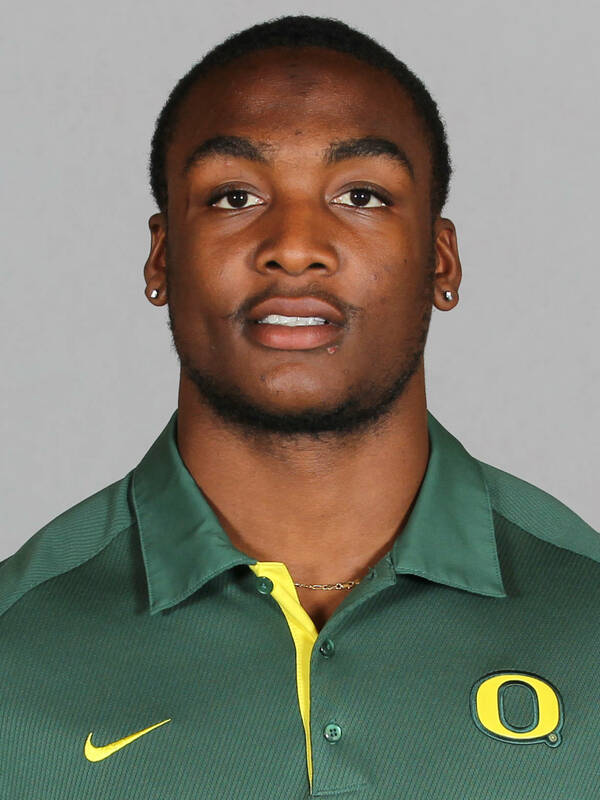 BEFORE OREGON — The four-year letterman, who was included on the Rivals250 list, garnered four stars according to Rivals.com and ESPN.com, and rated 37th among the nation’s elite receivers by Scout.com . . . Selected to play in the 2013 Semper Fidelis All-American Bowl . . . As a senior, led the team with 51 receptions for 902 yards (17.7 avg.) and 12 touchdowns while also carrying the ball 36 times for 202 yards and two scores . . . Named first-team Cal-Hi all-state as well as all-CIF San Diego Section second-team wide receiver . . . Played quarterback, wide receiver and safety for the Panthers, who finished the year with an 8-4 mark under head coach Chris Johnson . . . Prep team led the Division V in passing yards per game (201.4 avg.) in 2012 while finishing third in scoring (38.2 avg.) . . . He added 37 catches for 640 yards and six scores while rushing for 290 yards on 58 carries and one trip into the end zone his junior year . . . Also contributed 613 yards through the air (55-105) and five TDs . . . Caught 37 passes for 825 yards and 10 scores in 2010 following eight catches for 122 yards and a pair of touchdowns as a freshman. 2013 — Saw action as a primary reserve tackle on the defensive line in all four games . . . Contributed 3 total stops in the win over Cal, all solo ... Made four stops against Virginia, including two solo takedowns and a tackle-for-loss (two yards) . . . Recorded one sack for a loss of five yards, contributing to three total tackles (one solo) in the win over season opener Nicholls. 2013 — The starting end this season has made an impact on the defensive line with three sacks and 20 takedowns (ten solo) . . . Has forced a fumble in three of four appearances . . . Made four tackles at Virginia, including two tackles-for-loss for 11 yards (1.5 sacks), and racked up seven stops in the season-opening win over Nicholls, which included a two-yard loss on a sack. 2012 — Played in all 13 games, including starting nods at California and in the Fiesta Bowl … Finished the year with 12 of his 20 tackles being unassisted . . . Provided glimpse of the future, taking part in 59 snaps in win over Kansas State . . . Also took part in 62 plays at Arizona State . . . Credited with tackles in nine appearances, including four stops (3 unassisted) and one quarterback hurry in win at California . . . Added a trio of tackles against Tennessee Tech, Arizona and Stanford, including a tackle-for-loss of 1 yard against the Wildcats … Had a pair of unassisted tackles in the victory vs. Fresno State. 2013 — The primary defensive tackle started all three contests racking up nine total tackles thus far . . . Racked up a four takedowns (two solo), including an assisted sack for three-yard loss at Virginia, after recording three unassisted stops and a fumble recovery in the season-opening win against Nicholls. BEFORE OREGON — Playing both offensive tackle and defensive end, the three-year letterman was a key component on the McKay Scots . . . Received 6A all-league honorable mentions his junior and senior years as a tackle . . . Named an all league scholar in 2012 . . . recepient of the Monne Athletic Award. 2013 — Has made an appearance in all four games as a primary denfensive end reserve . . . Recorded four tackles, including one solo stop during the victory against Virginia. 2012 — Appeared in nine games while posting tackles in seven of them … Credited with a personal-best three unassisted (four total) stops against Tennessee Tech and three tackles vs. Washington . 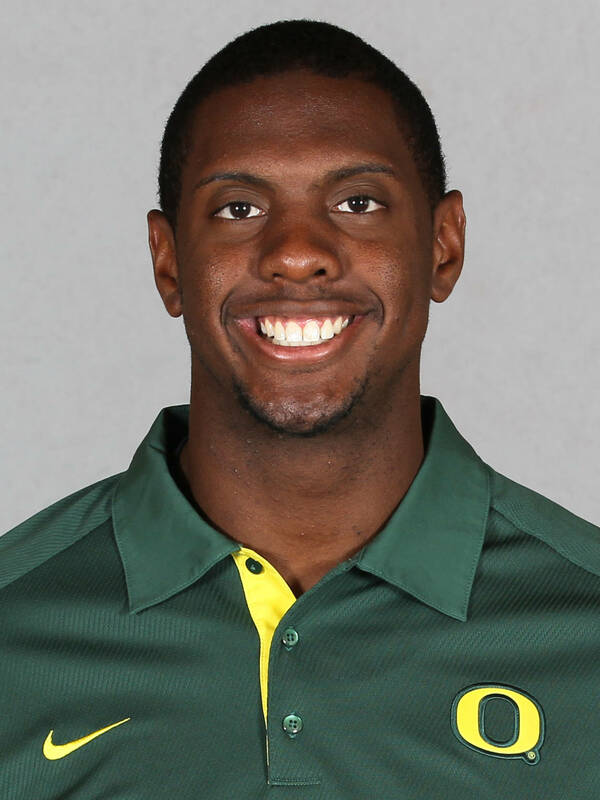 . . one tackle and one pass breakup in win vs. Colorado … Switched to the defensive side of the ball from tight end during 2012 spring practice and made one solo stop in collegiate debut vs. Arkansas State. Demonstrated huge improvement during the 2013 off-season while leading all tacklers in the Spring Game, posting a game-high nine tackles that include seven unassisted and one quarterback sack . 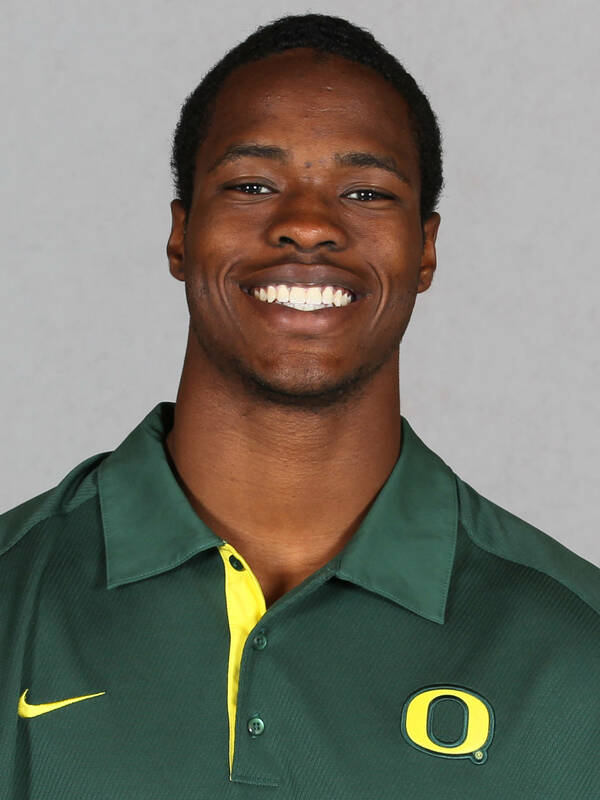 . . Clocked in fastest electronic 40-yard time of 4.98 in addition to posting 32.5-inch vertical jump. 2011 — Worked with the scout team at tight end. 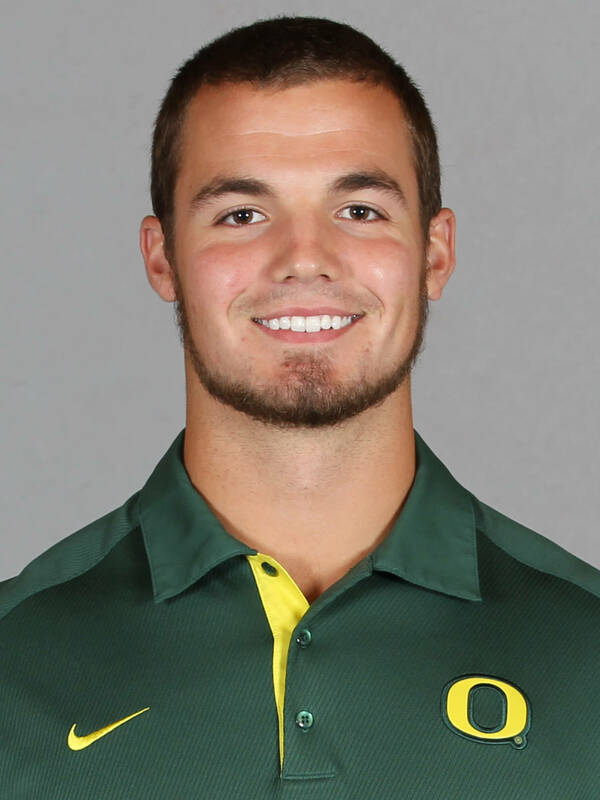 2012 — Joined the Ducks as a walk-on following the first game and spent the year honing his skills. 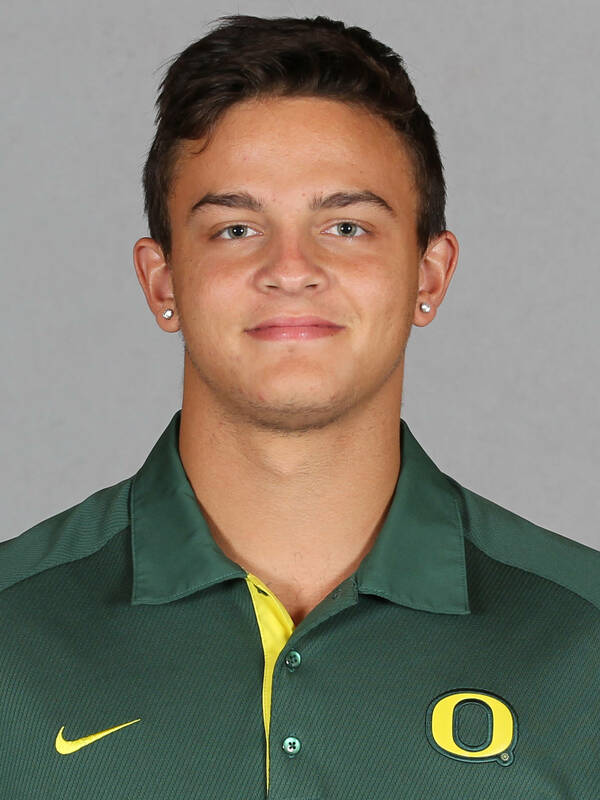 BEFORE OREGON — A two-year football letterman named to the Oregonian’s 5A first-team all-state contingent as a kicker his senior year after earning honorable mention distinction as a junior . . . Connected on 36-40 PATs and three of five field goals in 2011, including a long of 39 yards . . . Also earned Intermountain Conference all-league honors as a basketball point guard and soccer midfielder as a three-time basketball letterman. 2013 — Credited with two stops in the win over Cal ... Came off the bench to see action as an end in the first two contests of the season . . . Credited with a takedown and a pass breakup in the season-opening win vs. Nicholls. 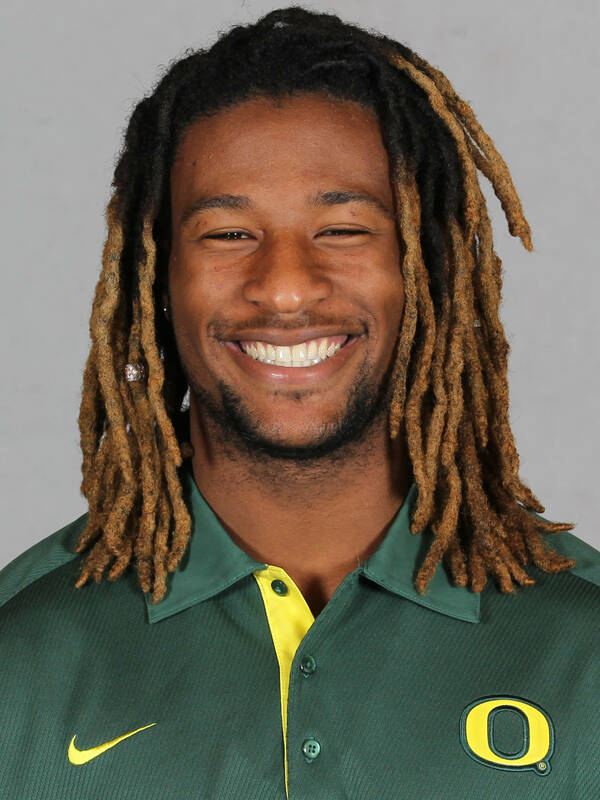 2012 — Made six appearances with his most extensive playing time coming at Oregon State (16 plays) … Enjoyed his most productive outing of the year at California, recording three stops (2 unassisted) and forced a fumble in win over the Golden Bears … Had two tackles, including one for a 1-yard loss in victory vs. Colorado … Also added two stops, including an assist for a 2-yard loss in victory over Tennessee Tech. 2013 — Made appearances at the defensive tackle position as a secondary reserve in all three matchups thus far . . . Made two stops (one solo) in both home victories over Tennessee and Nicholls. 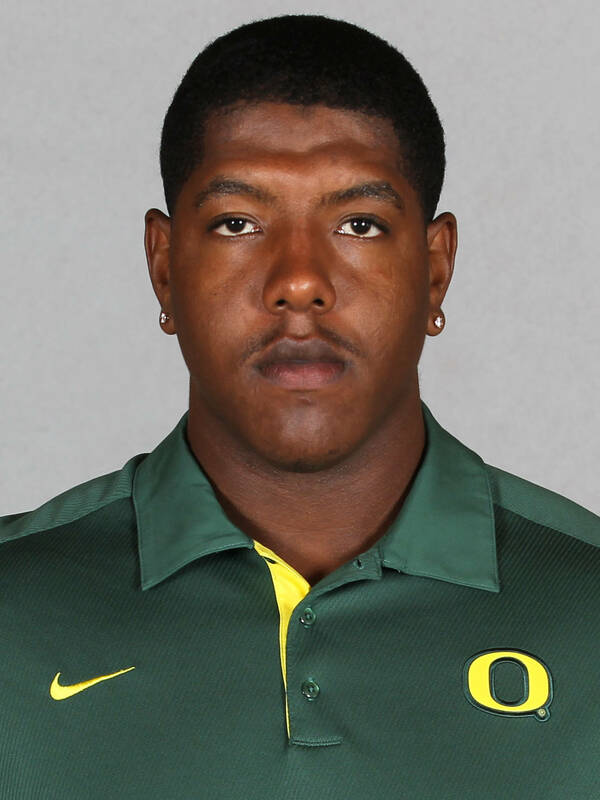 2012 — Recorded one tackle in win over Colorado … Had one stop in victory at Arizona State … Made one tackle in win vs. Washington … Recorded two stops, including 0.5 for a two-yard loss in victory over Tennessee Tech. 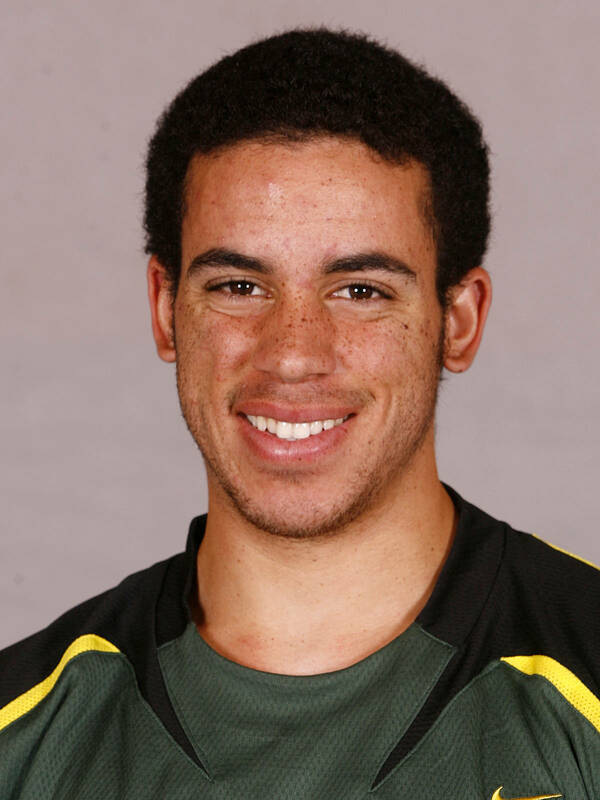 2011 — Defensive scout team player of the week leading up to road win at Arizona.